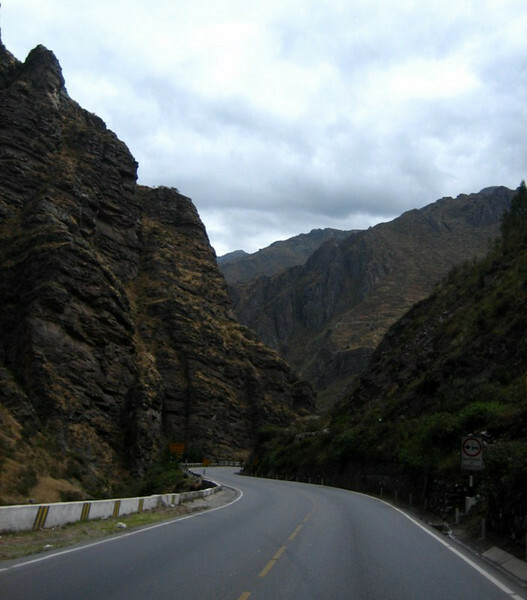 From Huaraz, I took the more scenic mountain route down to Lima, through Huanuco. 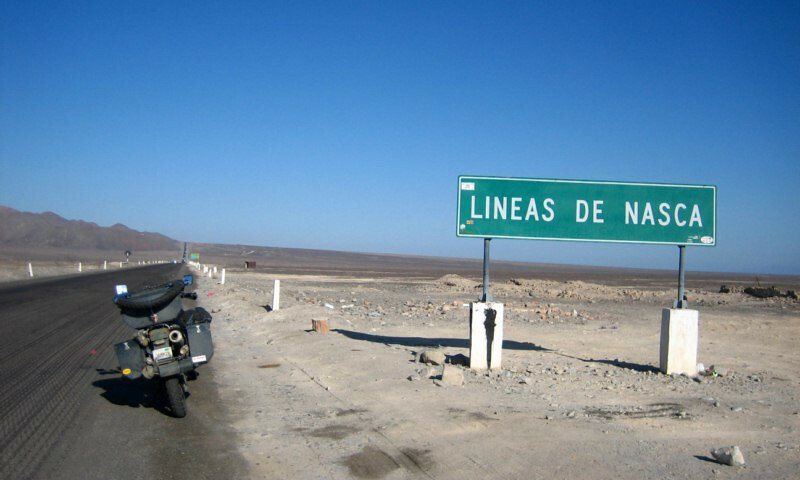 After taking care of some business in Lima, I headed south along the coast to see the lines at Nazca. 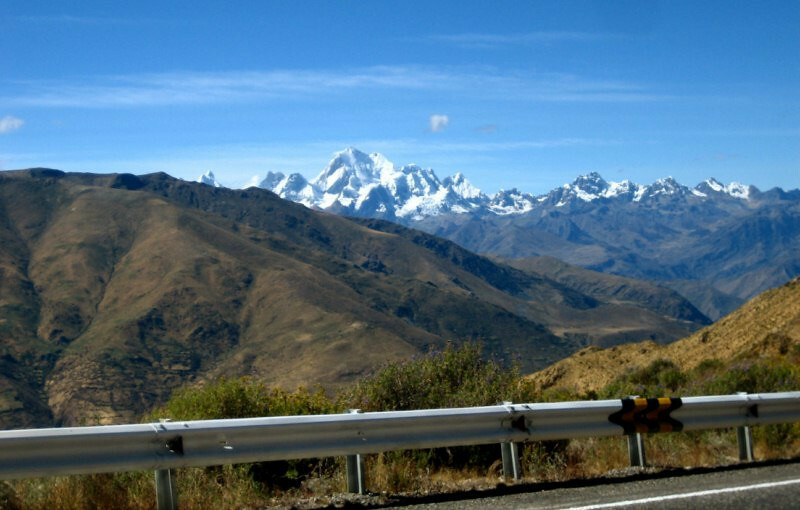 Heading south from Huaraz the road climbed up to 4,300 m (14,100 ft) and these snow-peaked mountains were just sitting on the altiplano without a grand prominence. Looked like an easy climb. 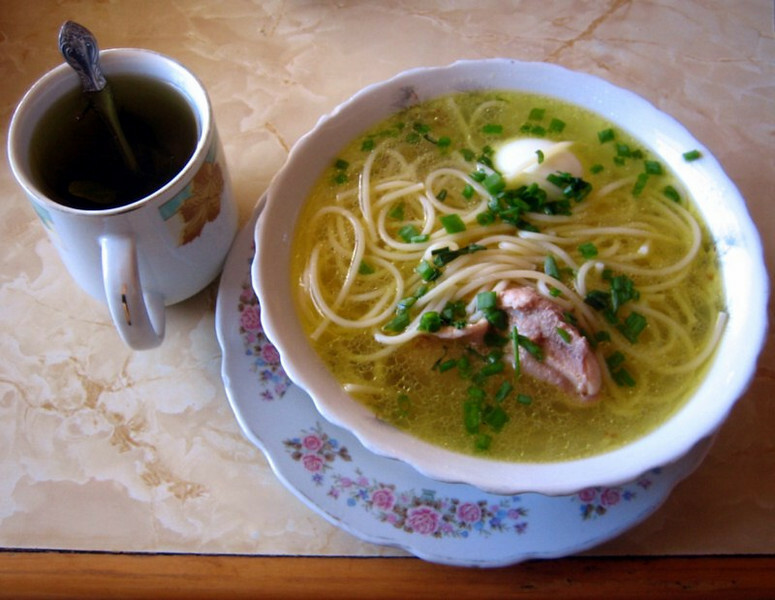 Warming up with some meaty noodle soup and mate de coca at the turn-off to Huanuco. 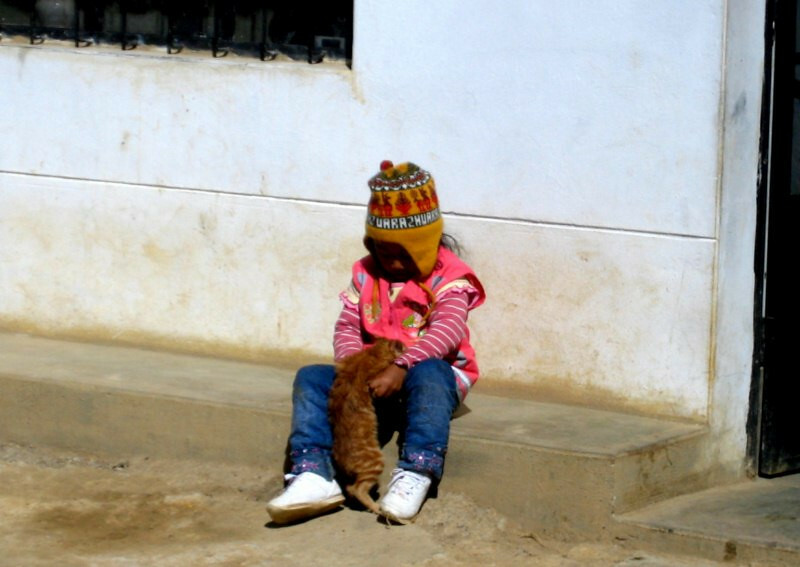 This girl, probably the daughter of the restaurant proprietor was tossing this poor kitten through the air for her amusement. 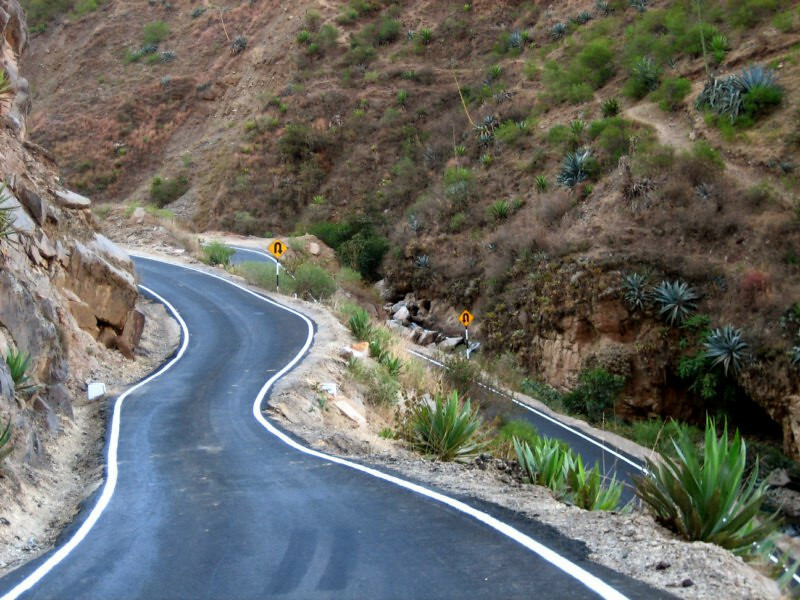 Traffic was much reduced on the road to Huanuco and the curves made for a fun ride. Nice view all around with snow peaks showing up, now and then. 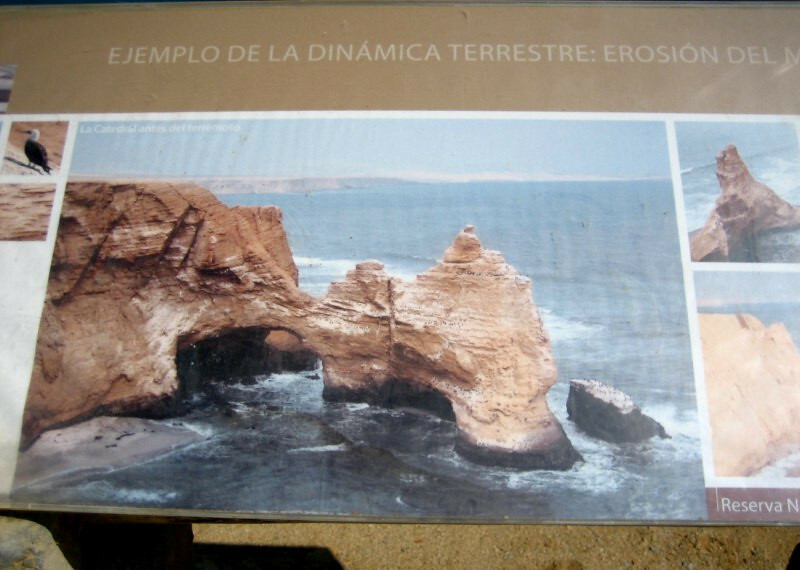 Interesting exposed geology. 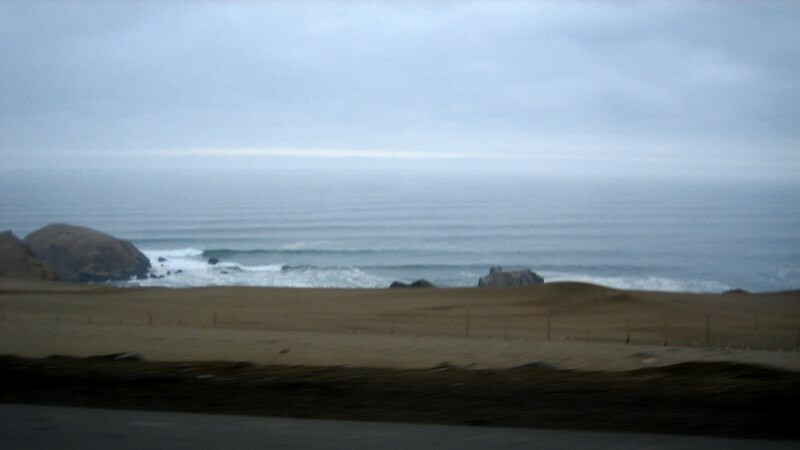 The sedimentary lines curve up to the peak. 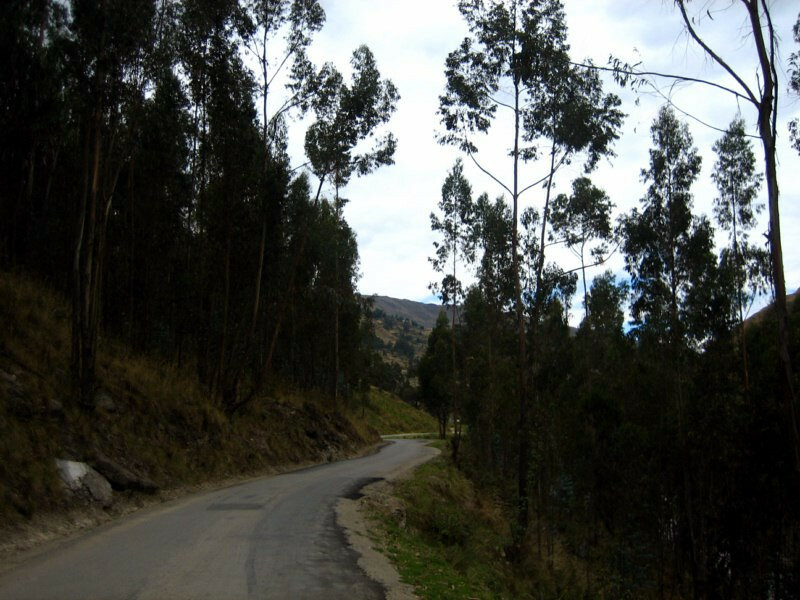 The road was climbing higher through some picturesque landscapes. 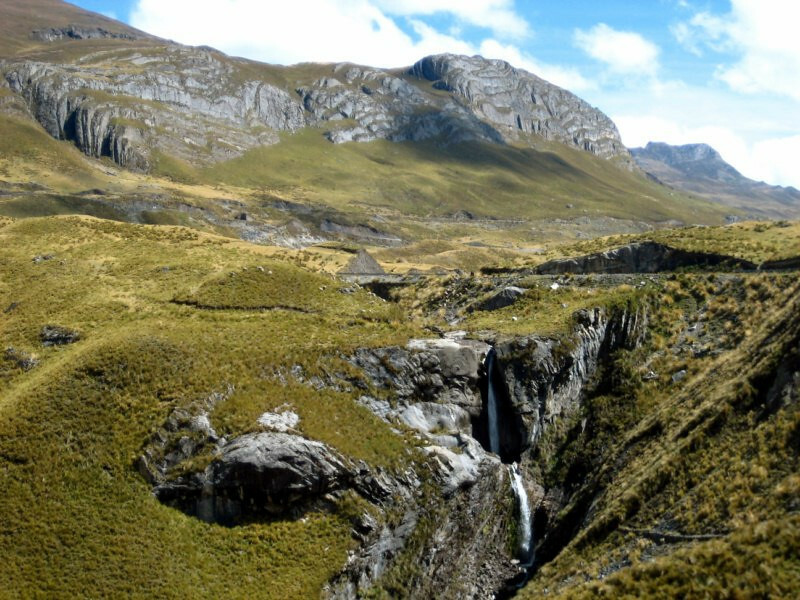 The rocks above look volcanic in the smooth shapes they take and the rushing sound of the waterfall made for an energetic setting. The pavement was in excellent condition with jagged peaks all around. 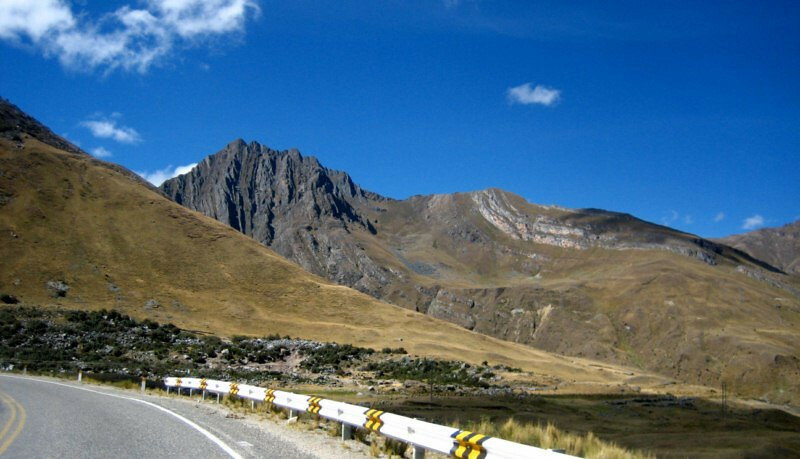 A wide view of the mineral-rich peaks running along the road near the summit at 4,700 m (15,400 ft). 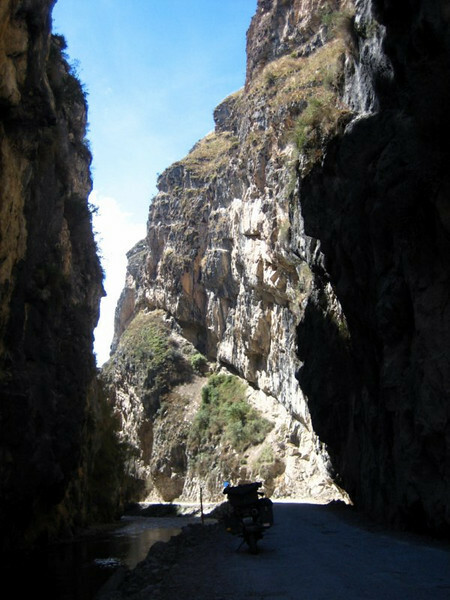 The road quickly dropped down on the other side to 2,900 m (9,500 ft), getting very narrow through this canyon. 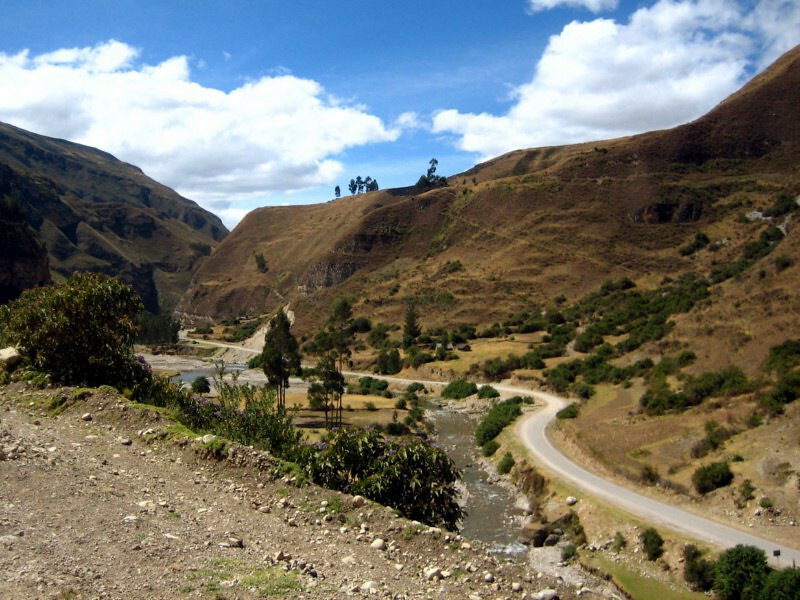 The scenery changed, getting drier with more human settlements. 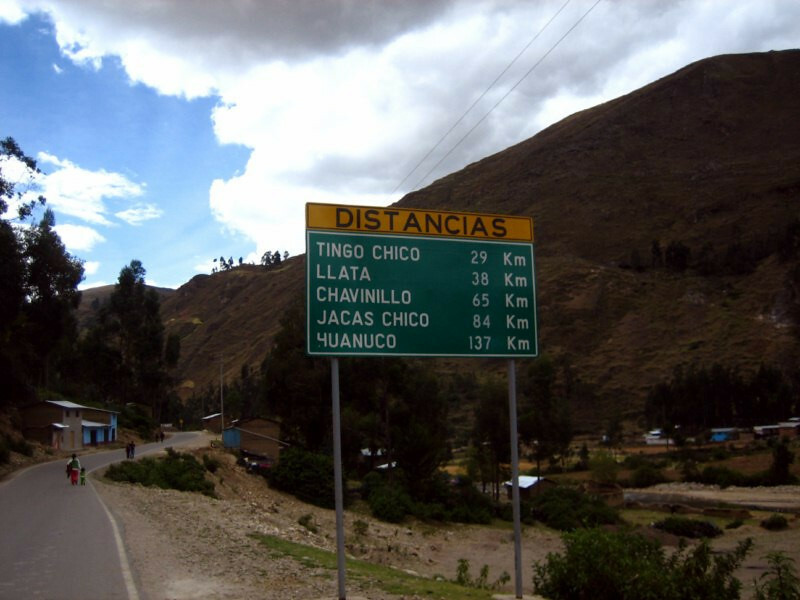 Distance board; heading to Huanuco for the night. Having lunch surrounded by eucalyptus trees. 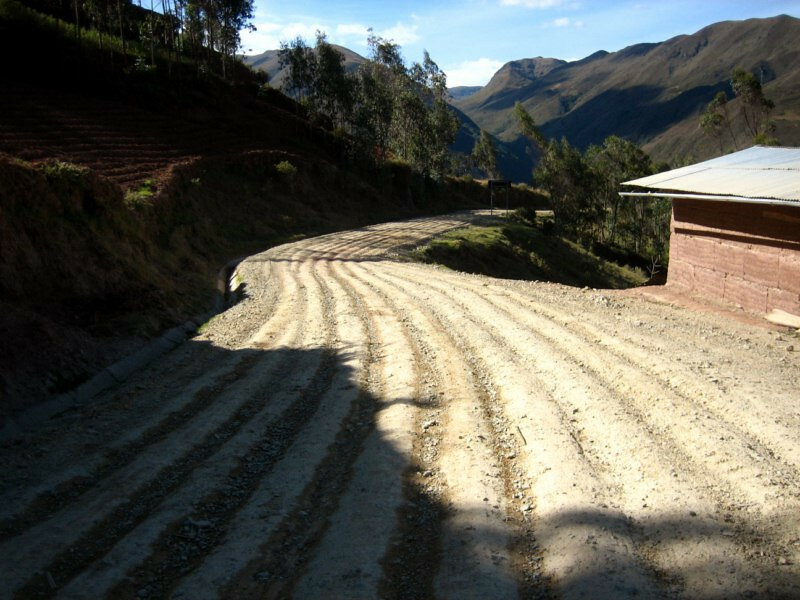 The road got in progressively worse shape until it was just gravel, which is much better than a misshapen tar road. 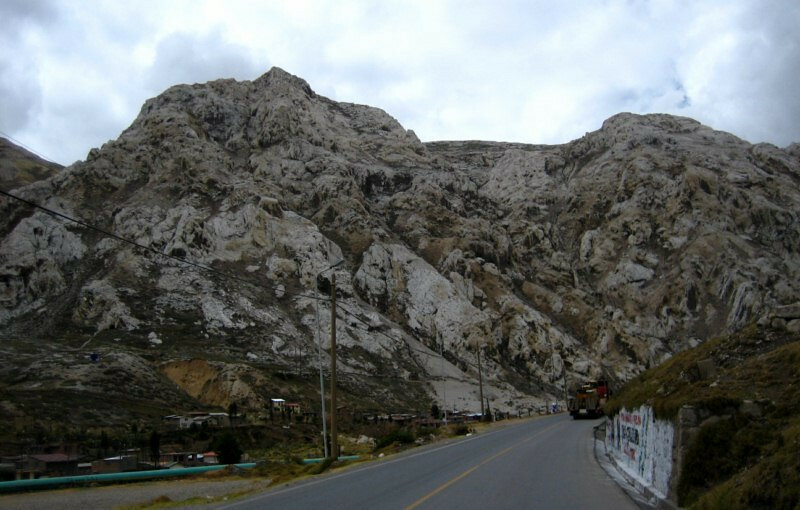 Passing by a local geologic feature called the Inca’s Crown, where the road peaked one last time at 4,000 m (13,100 ft) before dropping down to Huanuco. There was heavy construction work going on and they stopped all traffic, but they let bikes through. These channels in the road made it quite challenging to keep the bike balanced with the front wheel skitting about. 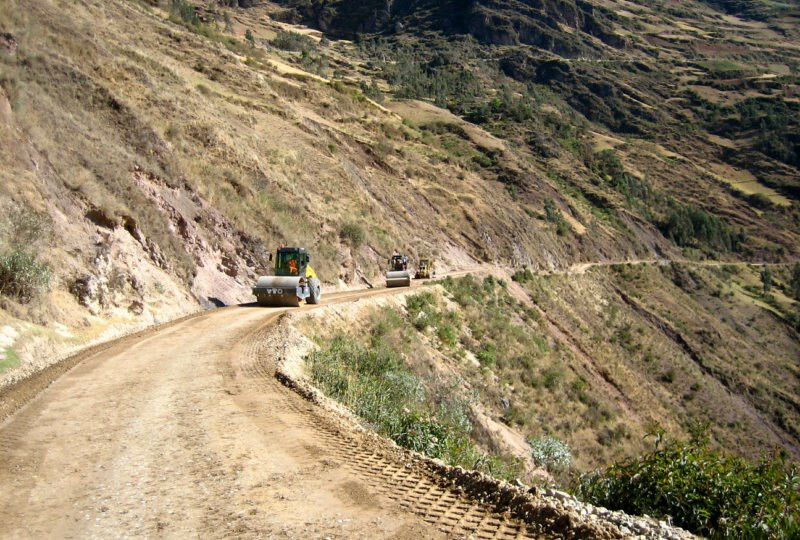 Looks like they’re paving the whole stretch that’s gravel. Following some rollers back down. Newly laid tarmac, which was less than a centimeter of asphalt over the dirt. I had to wait an hour at one section for the new tarmac to dry enough for me to ride on. 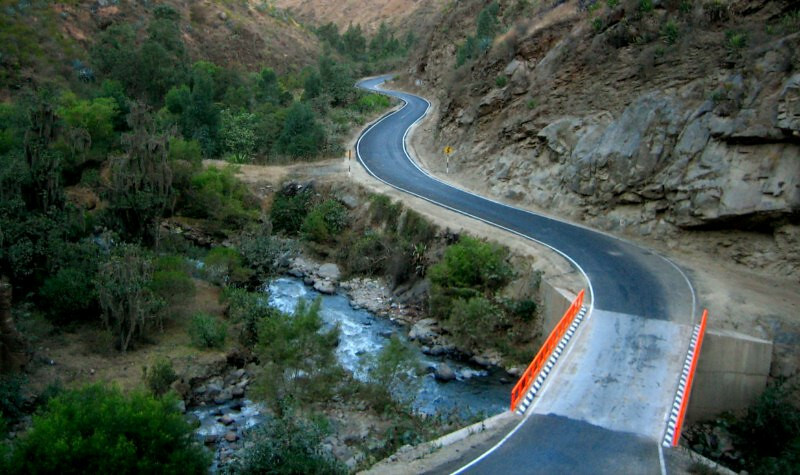 The road dropped very quickly in elevation with switch-back after switch-back. A very fun ride. I like the juxtaposition of the fluorescent orange bridge amongst the natural setting. 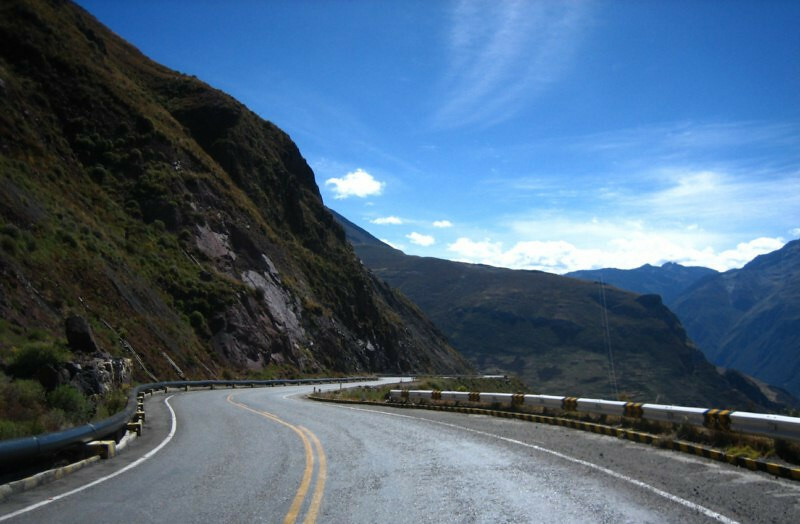 With the road dropping down to 1,900 m ( 6,230 ft) at Huanuco, today was another roller-coaster of a ride covering 6,700 m (21,980 ft) in elevation changes. 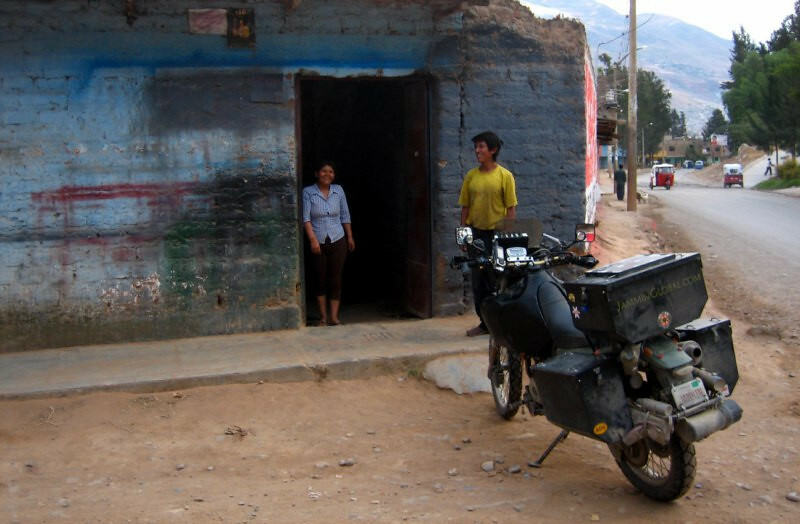 After finding a cheap hotel in Huanuco, I was riding around trying to find a safe place to park the bike and this lady hailed me down and told me to follow her to their welding shop, where I could park the bike for the night. Very nice couple. 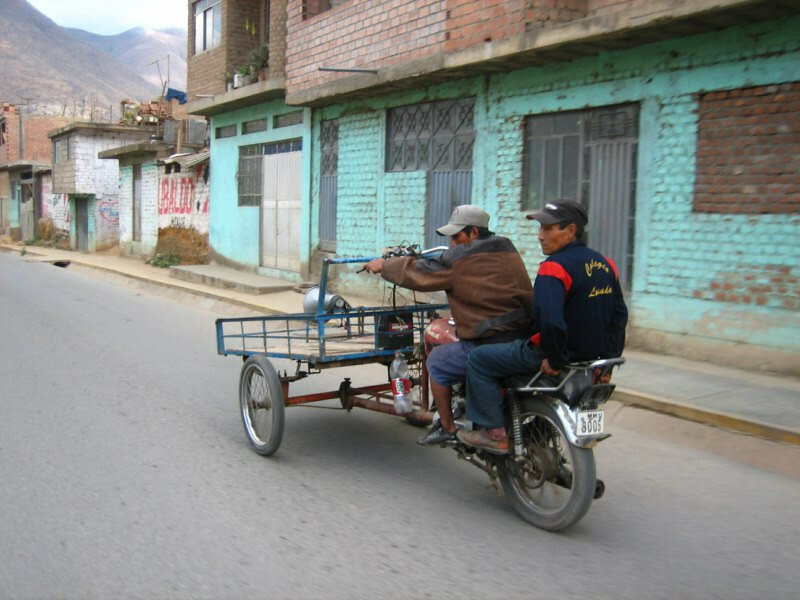 Heading out of Huanuco the next day for Lima, saw this motorcycle contraption – a cart added to the front steering wheels. I guess you don’t need a long chain this way. 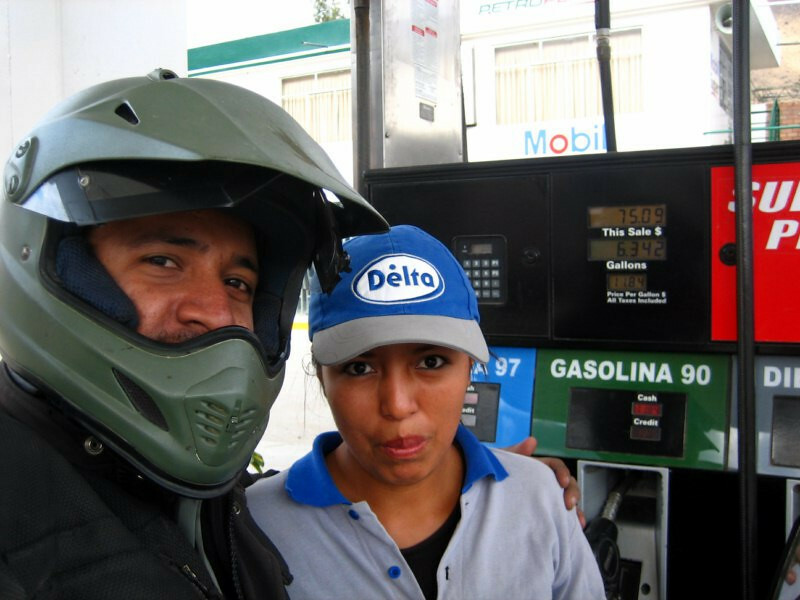 This gas station attendant was flirting with me, so had to grab a pic. 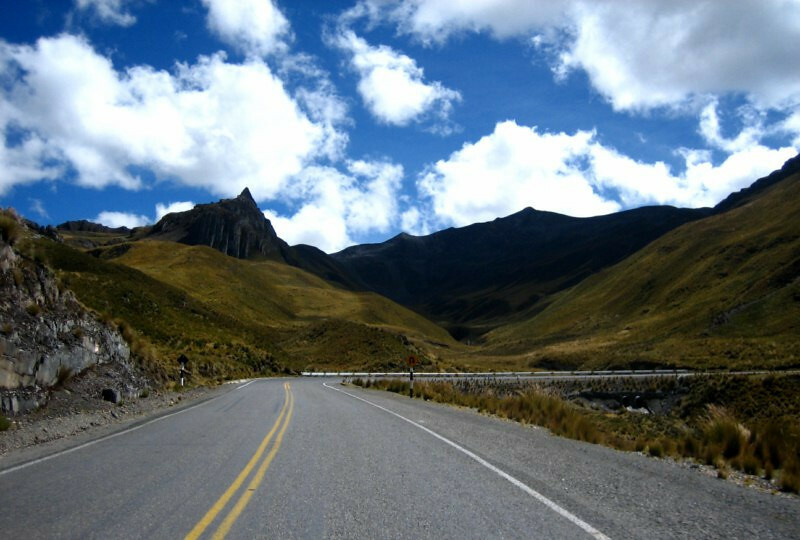 Climbing back up to the altiplano. 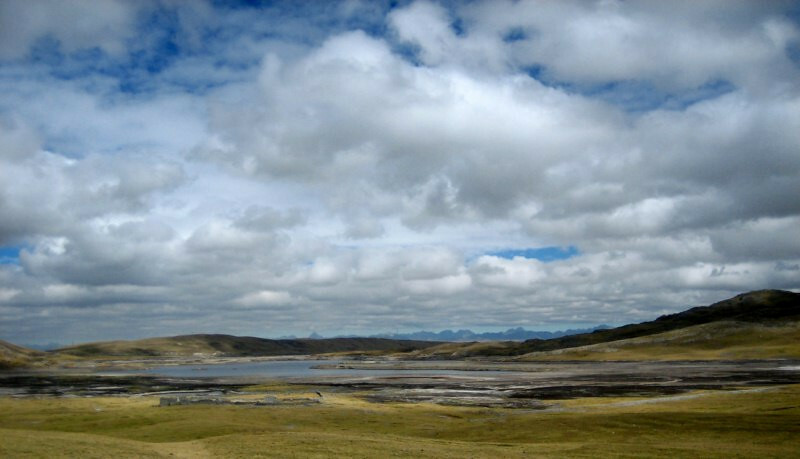 The Andean Altiplano, high plains at 4,100 m (13,450 ft). 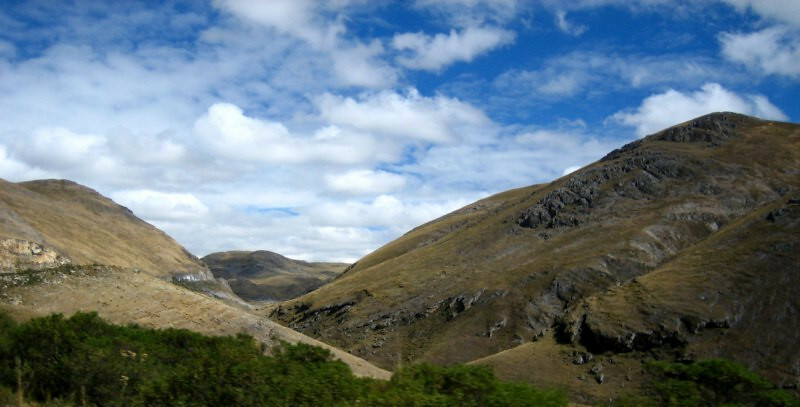 This high elevation plateau, the largest outside of Tibet probably formed due to the weakening of the Earth’s crust after the Cordillera Occidental (western) and Oriental (eastern) formed leaving a wide gap between them. 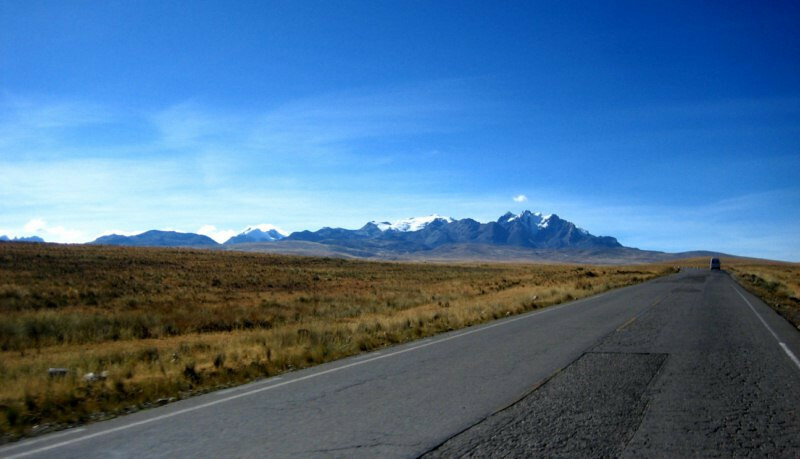 The road continued across the bleak landscape for about 100 kms (62 mi), but there was something beautiful about it. Passing through one of the many small towns along the way. It was chilly up here and I had on most of my layers and was comfortable. 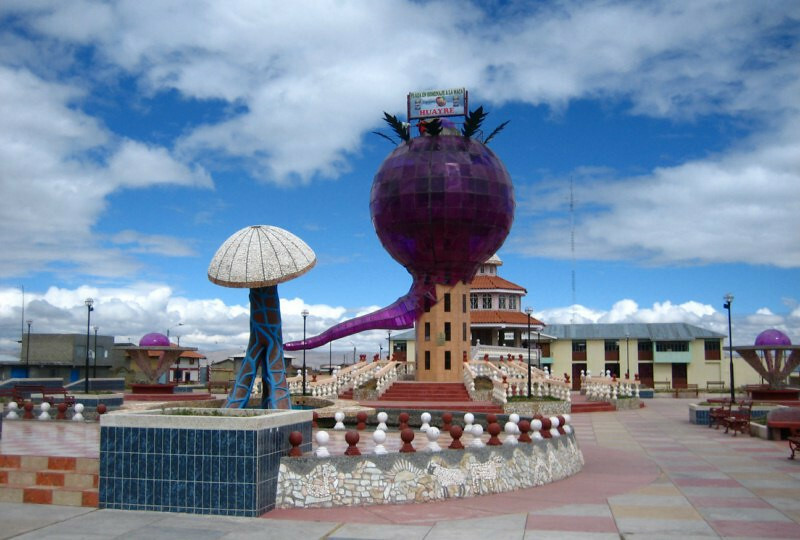 Strange purple sculpture with trippy mushrooms in the center of one of the towns. 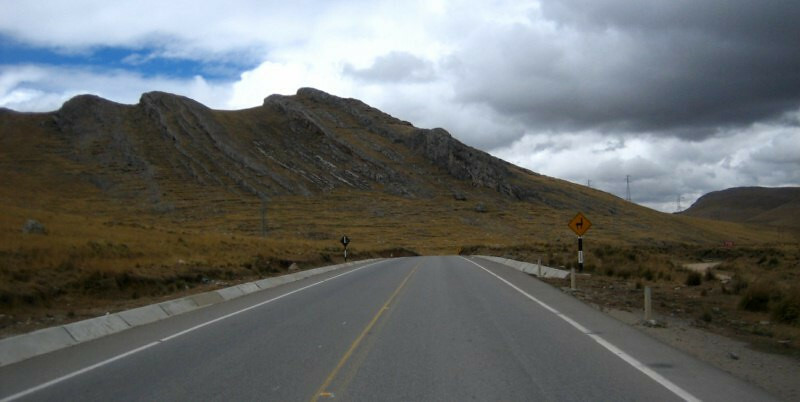 Towards the end of the altiplano ride, mountain ridges started showing up. 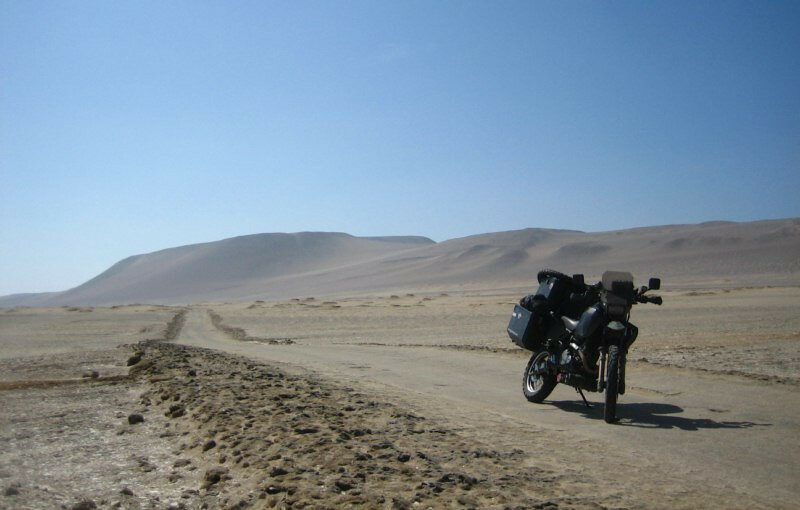 Taking in the slanted sedimentary lines and the llama road sign. 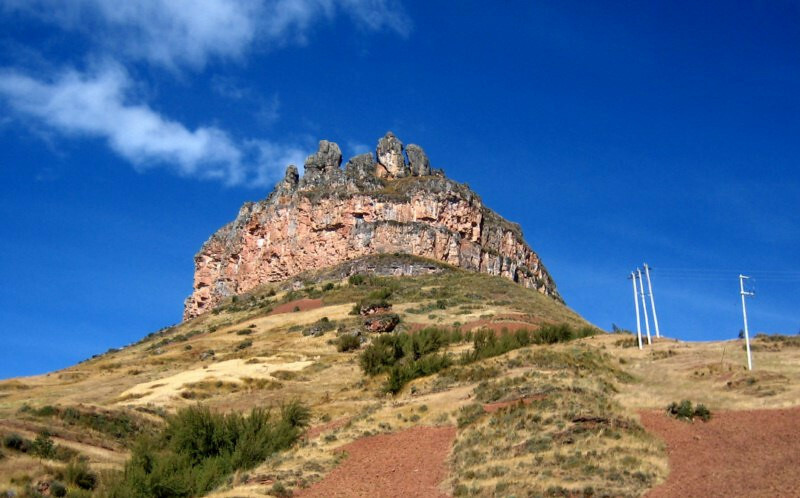 Interestingly-shaped mountain. It wasn’t smooth like all the others around. 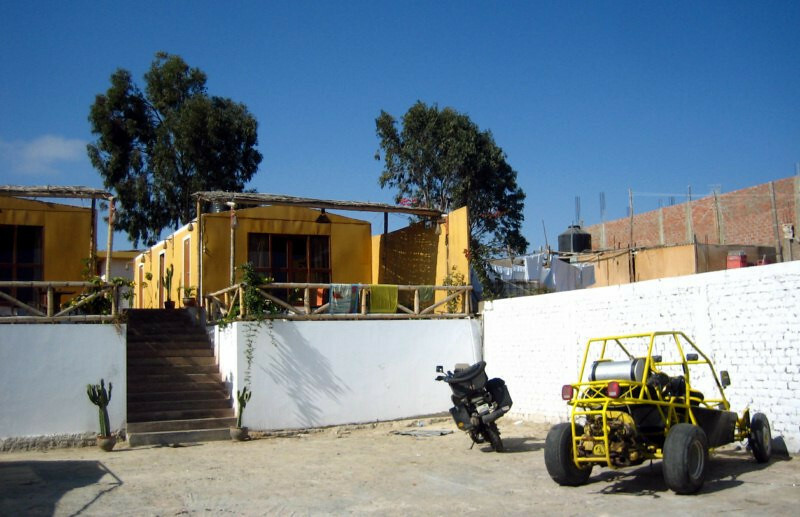 Having lunch at La Oroya, the turn-off down to Lima at a small road-side Cevicheria, which Peru is known for. 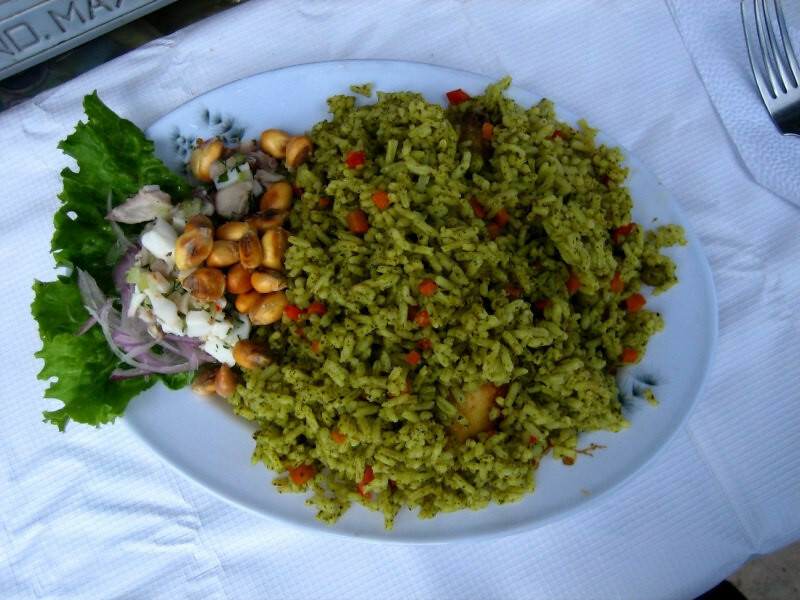 Chicken and rice with some ceviche, which is fish cooked only with lime juices and some other natural acids. Kind of like sushi, but it’s technically cooked, even though it’s cold. I thought the road would be dropping down from here, but we were climbing again. 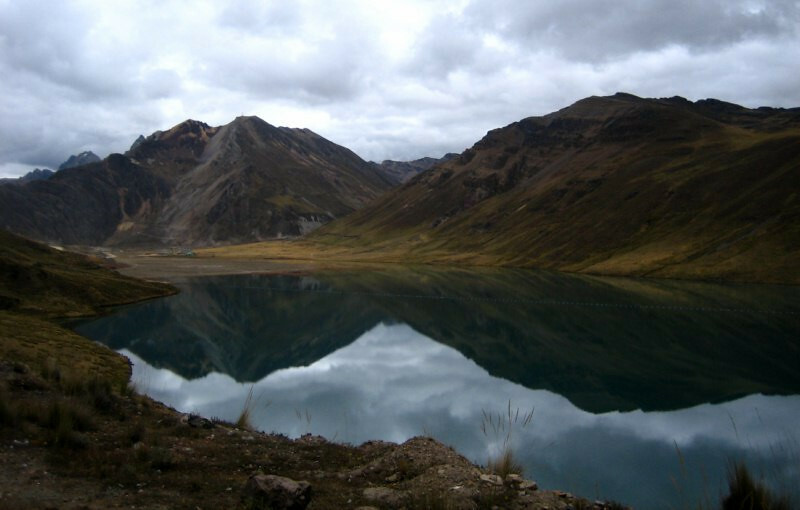 Passing by mineral rich mountains and like-wise, turquoised lakes. Their stillness reflecting the riches in the peaks. 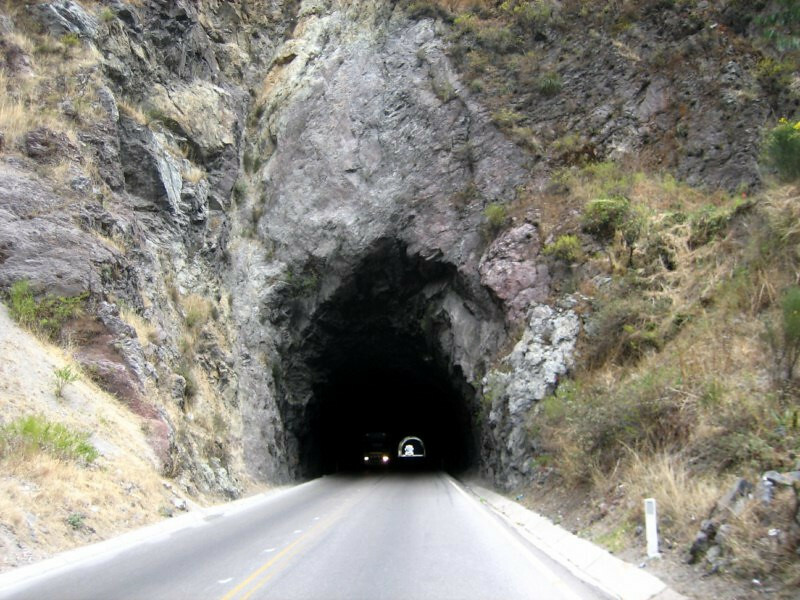 With so many minerals within easy reach, hardly surprising that mining is the main activity in this high, desolate region. The mountains were being cleanly shaven off. 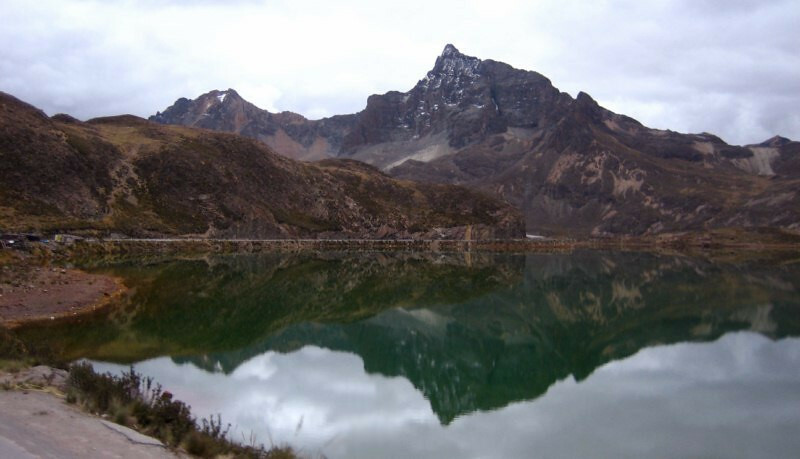 Another still lake reflecting a jagged peak. A panorama near the summit of mineral-rich rocks and the lakes they’ve colored. 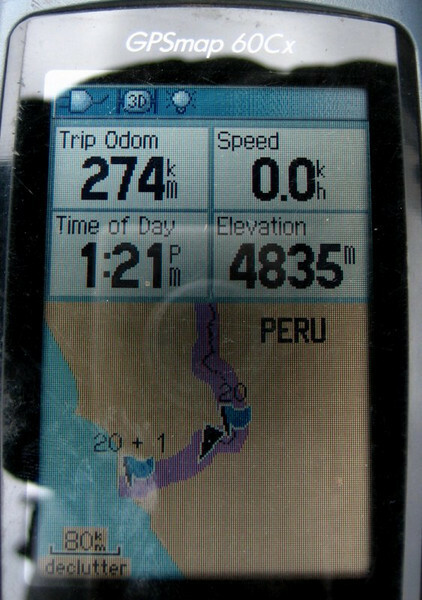 Peaking at 4,835 m (15,860 ft) before dropping all the way down to sea level at Lima, making this the most roller-coaster of a day so far, covering 10,770 m (35,325 ft) in elevation changes. 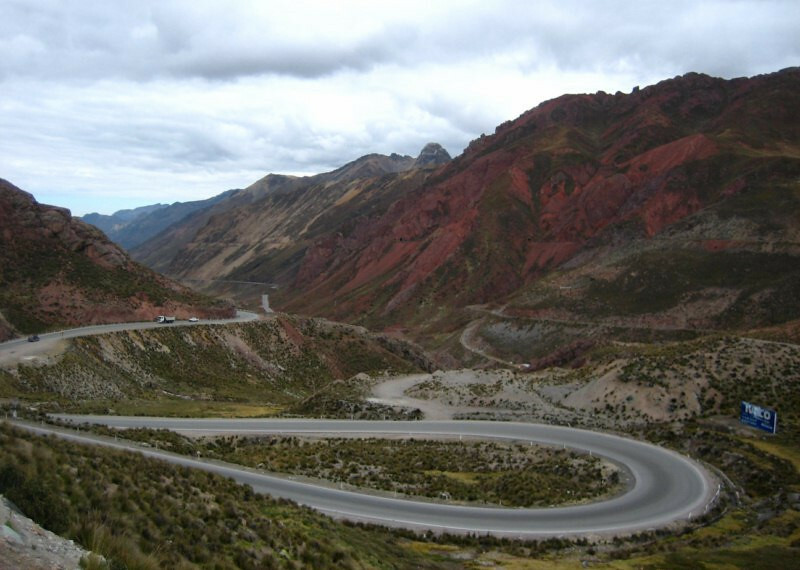 Dropping down the switch-backs with beautifully red-colored hillsides. 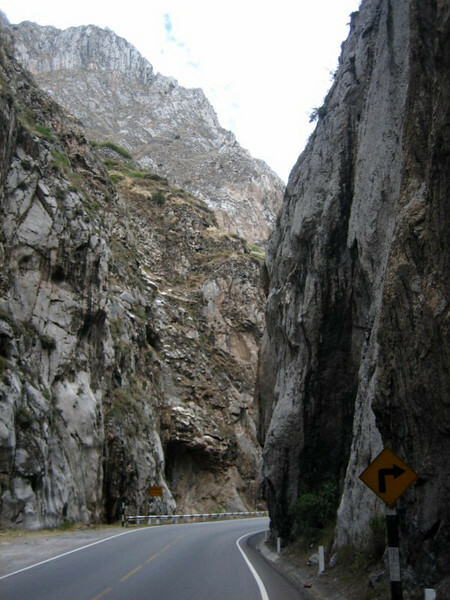 The road getting narrow as it wound its way through the guarding mountains. 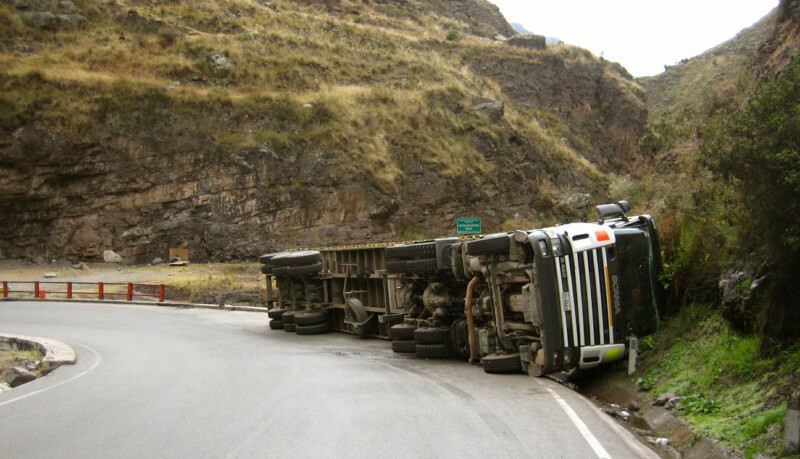 Ooops, a case of STFFC (Speed Too Fast For the Conditions), taking this curve with a bit too much speed. Drivers down here definitely drive with a lot more abandon, especially the buses, keeping me on my toes all the time. 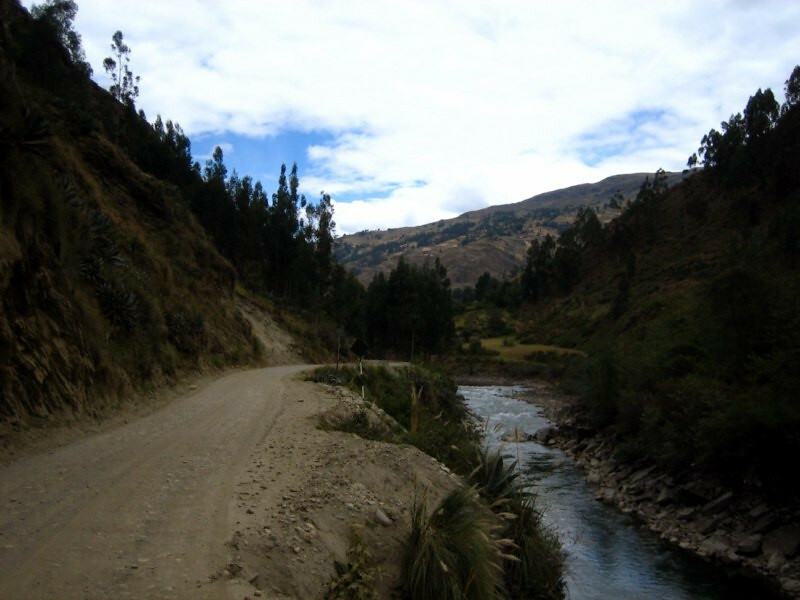 The road got very narrow in places as the route followed the easiest way down. 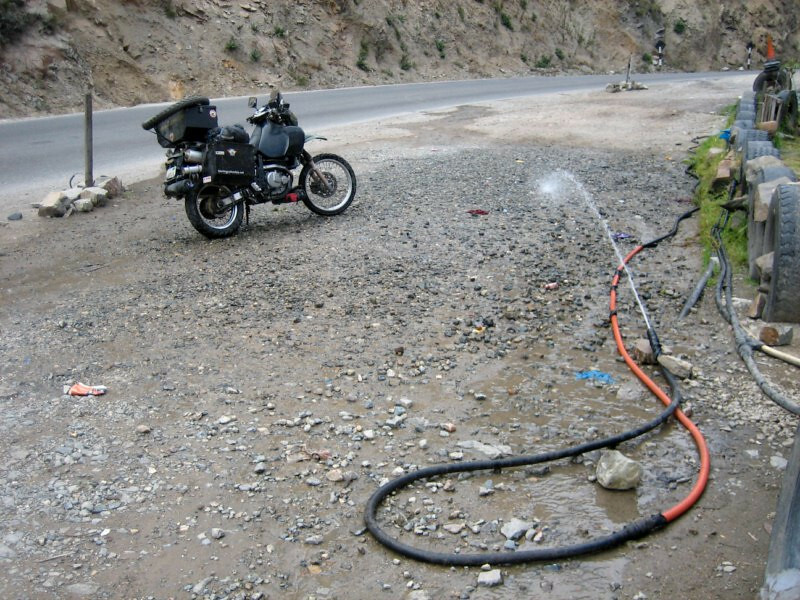 Since I was making good time into Lima, I took a break and washed the bike with these free water hoses. They’re connected to a river and the pressure is all natural, so they’re on all the time. Just rinsing the rims and the engine, no need to be carrying extra dirt around. 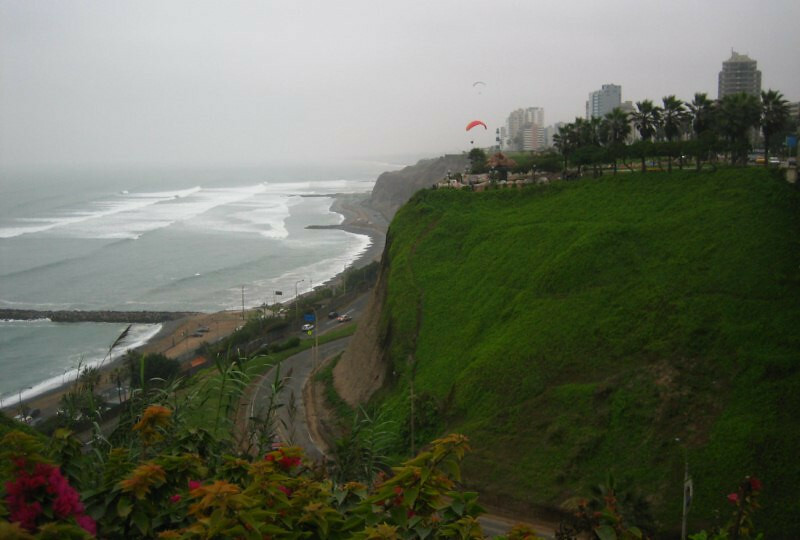 The cliffs at Miraflores in Lima, where the strong ocean wind against the raised cliffs provides for some great paragliding. 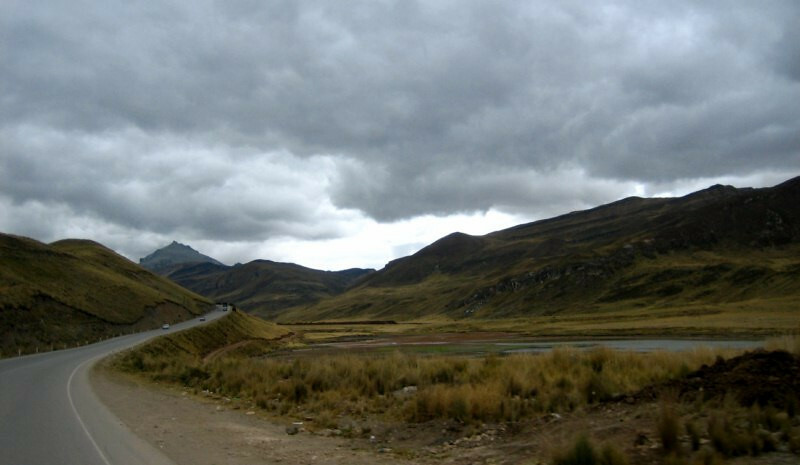 And the overcast clouds that shroud Lima during their winter months. 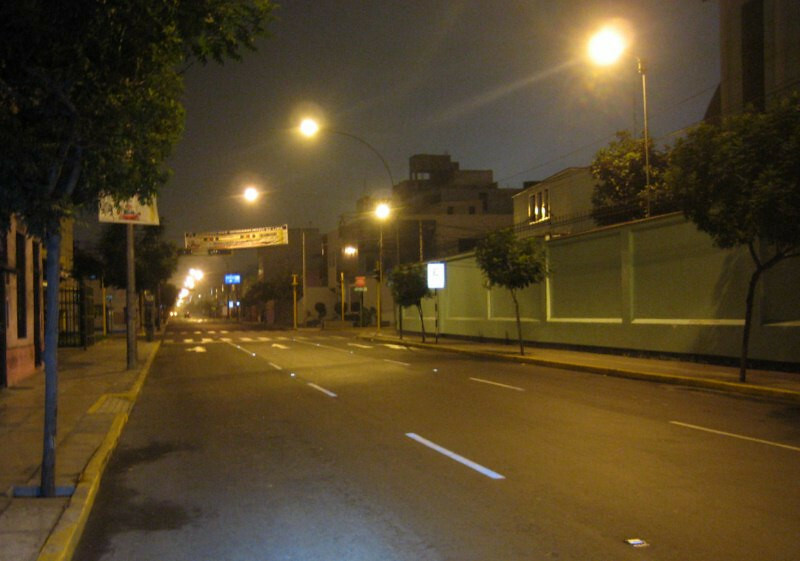 Didn’t see the sun or sky the whole time I was in Lima. 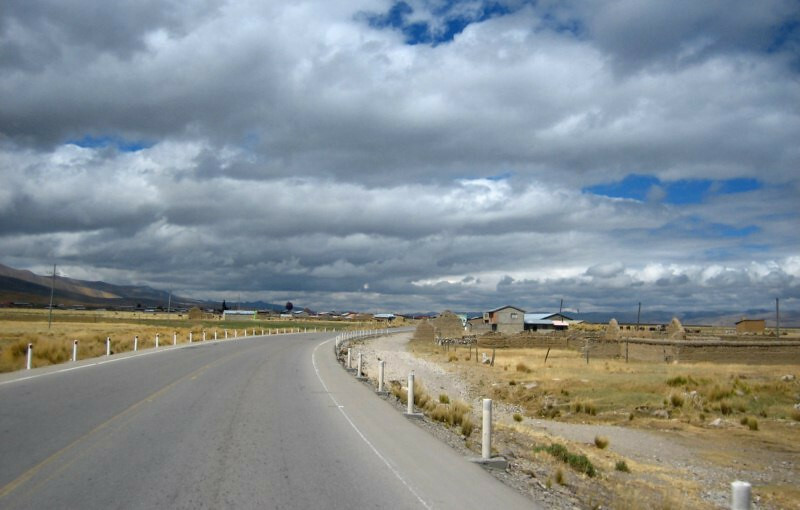 The temps were also much cooler than I expected, having come down from the altiplano. The air is very humid, around 95% and that makes you feel much colder than what the temperature actually is. It was around 14 C (57 F), but felt like 5 C (41 F). 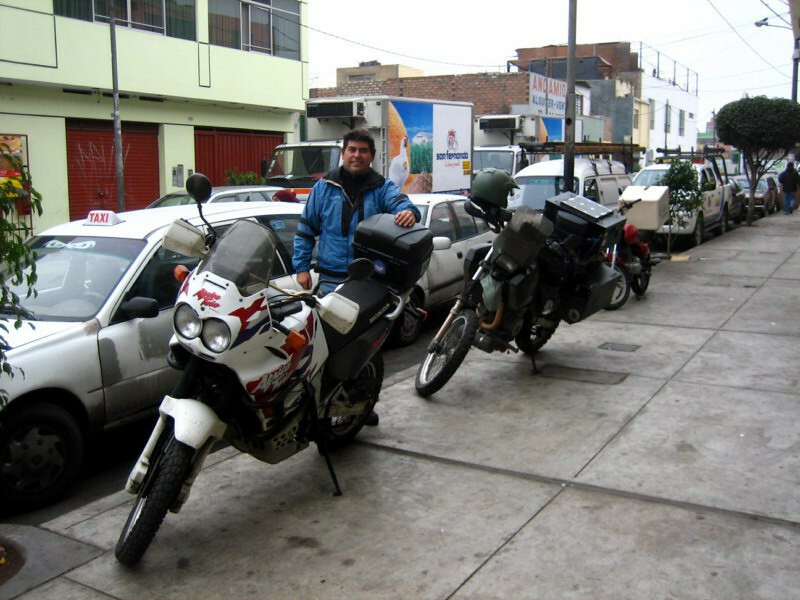 Meeting up with Yuri, riding a Honda Africa Twin. 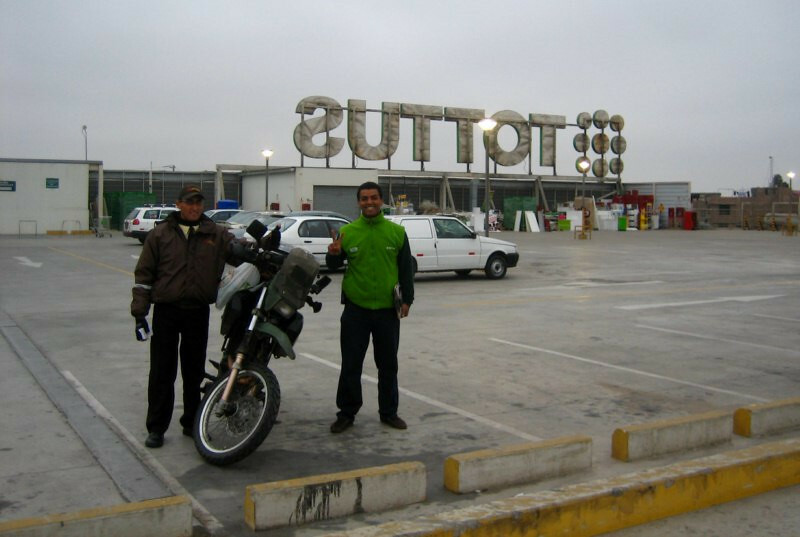 He’s a friend of Sargento’s (Mexican rider I met in Cartagena) and he took me around town to take care of a few things. 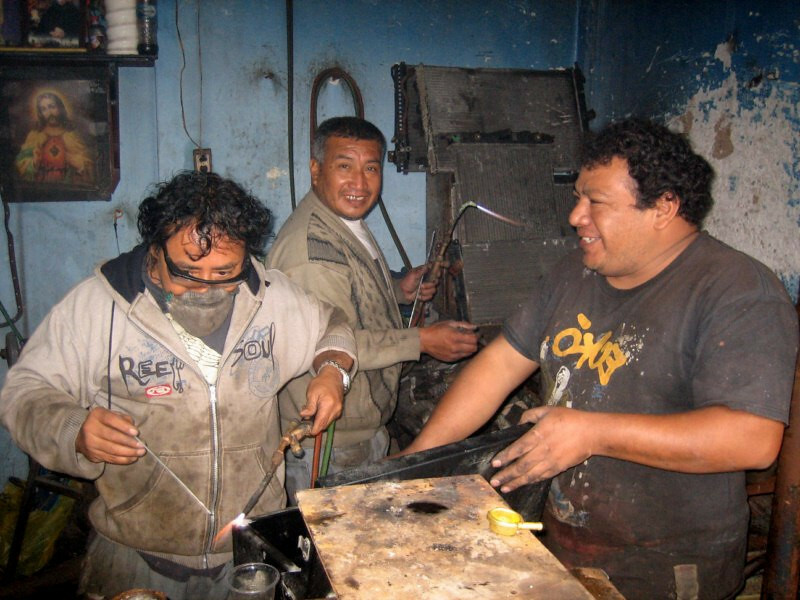 Welding up the corners of my panniers after the bike fell in Huaraz from the flat tire. 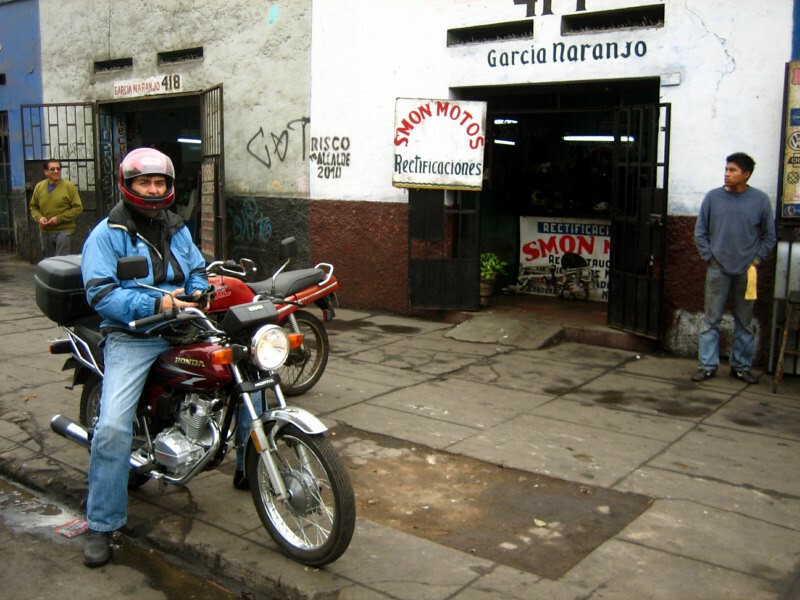 Riding 2-up on Yuri’s little Honda 125cc bike into a more seedy part of town to find an aluminum machinist. 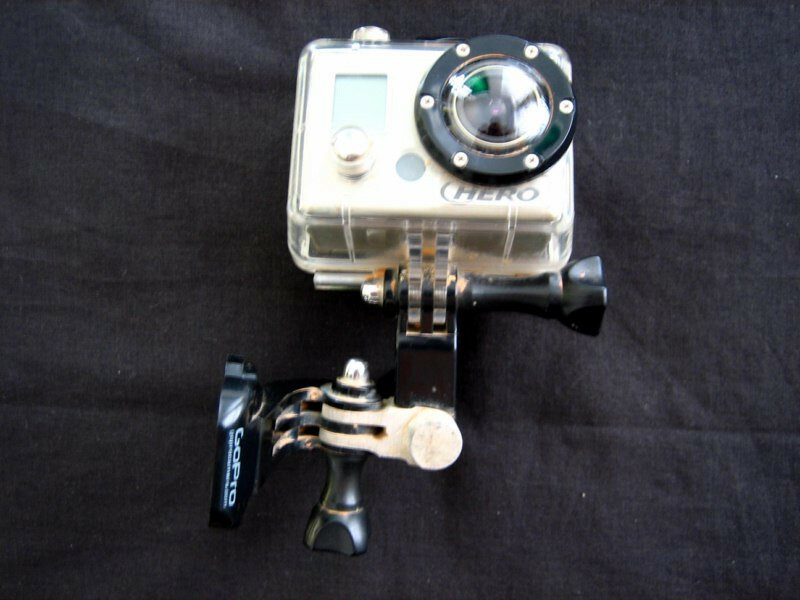 When the bike fell in Huaraz, my helmet was on the rear-view mirror with my GoPro helmet camera attached to it and a piece in the bracket broke. The machinist did a fine job of replicating the plastic piece in aluminum. Cost $20. 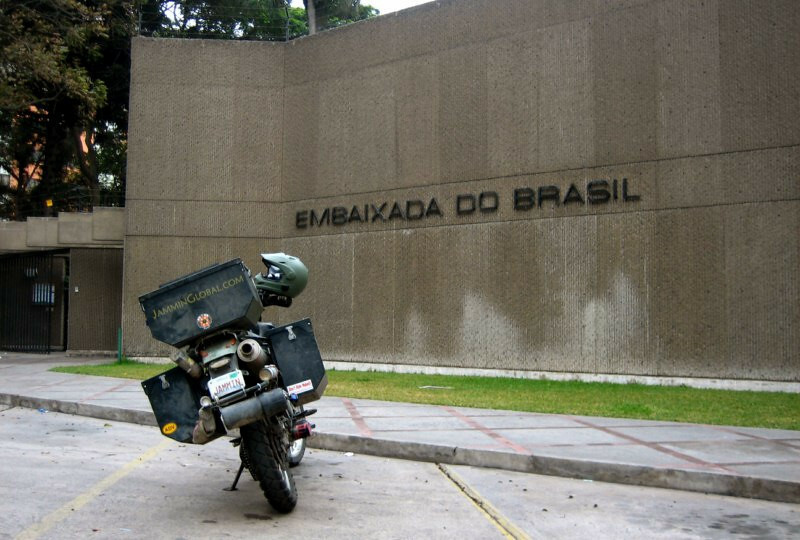 My main reason for coming to Lima, to get my tourist visa for Brasil. 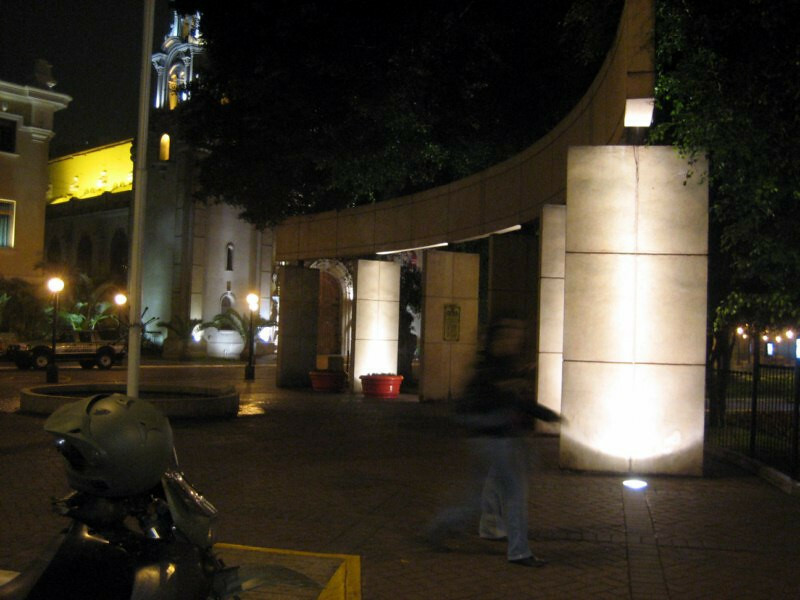 The staff were quite helpful and processed my visa in a day. 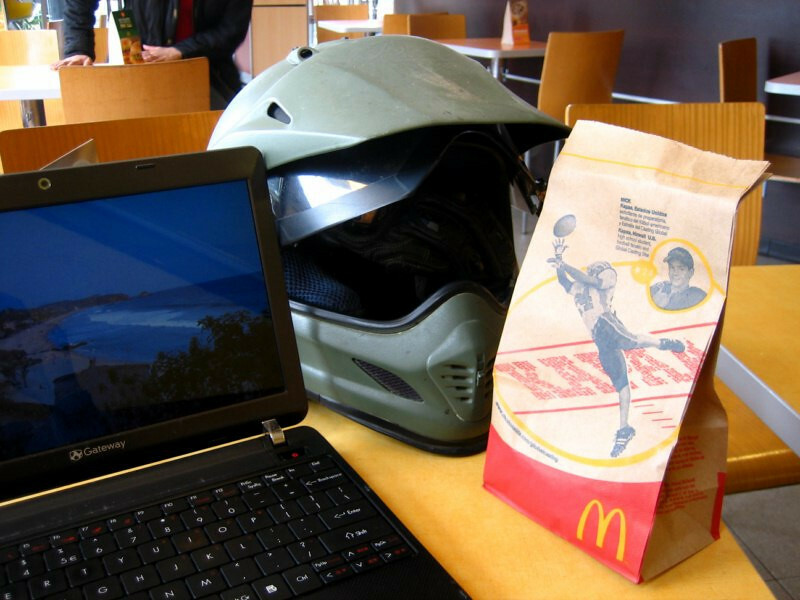 Hanging out at a nearby McDonalds for their free WiFi while I waited for my visa pick-up time. A McChicken tastes the same everywhere and apparently, costs the same too, $1, S/.3. That’s my Acer/Gateway netbook that I’m traveling with and posting all these pictures from. It’s been working really good so far and the 10.6″ screen isn’t too small. 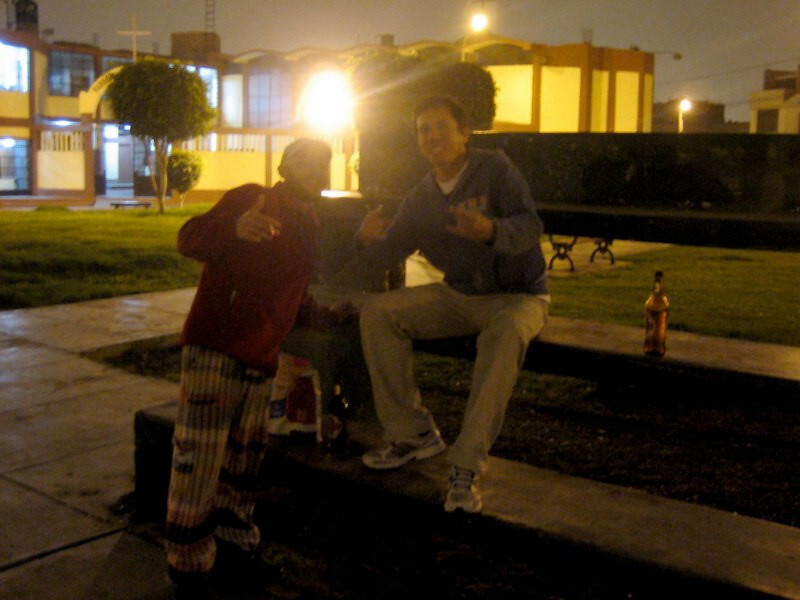 Meeting up with Edison through CouchSurfing at Parque Kennedy. Riding back to his house near the airport at 1:30 in the night. 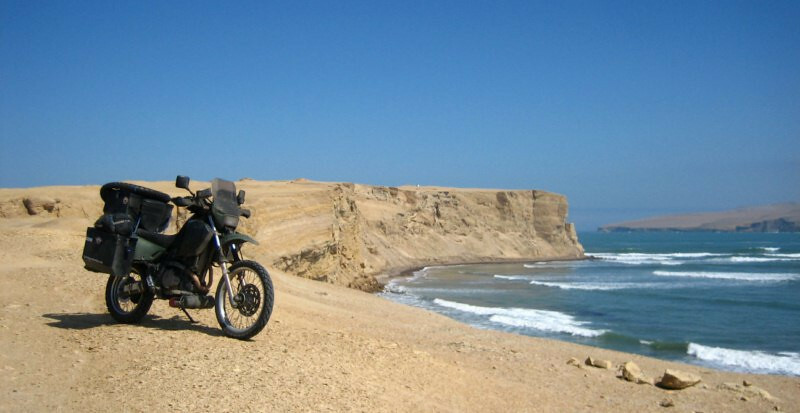 I heard Lima traffic was terrible. 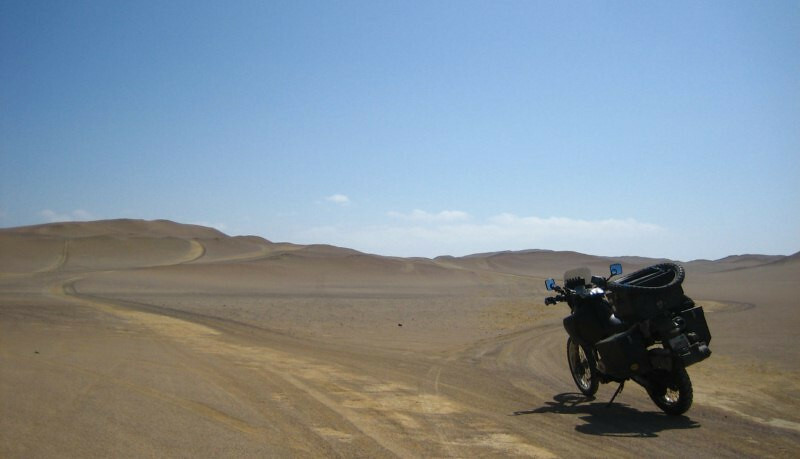 Not a car in sight. That’s Edison on the right and Carlos, another CouchSurfer from Buenos Aires. 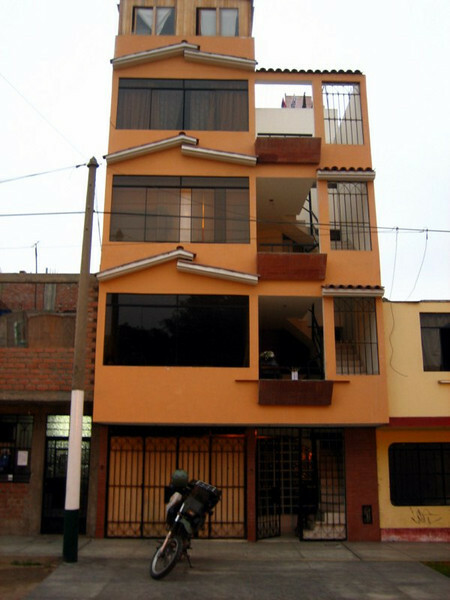 Edison’s family’s narrow 4-story house. 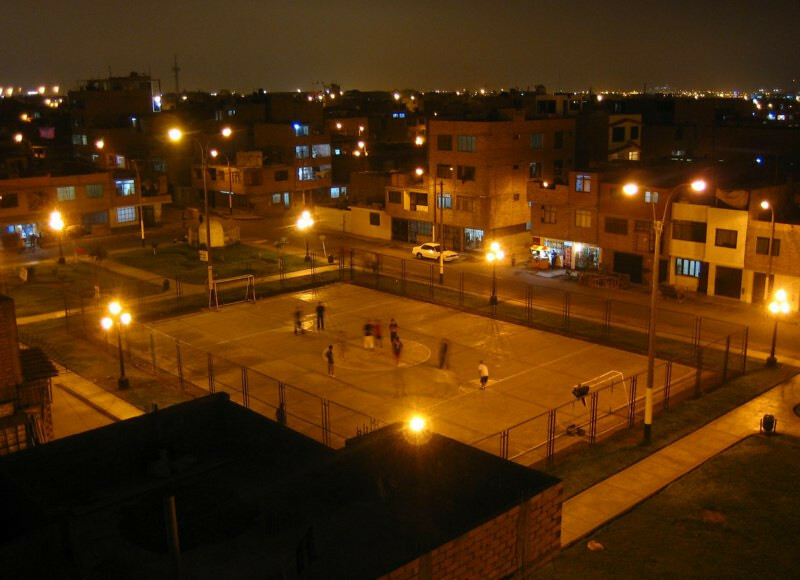 A panoramic view of his neighborhood. 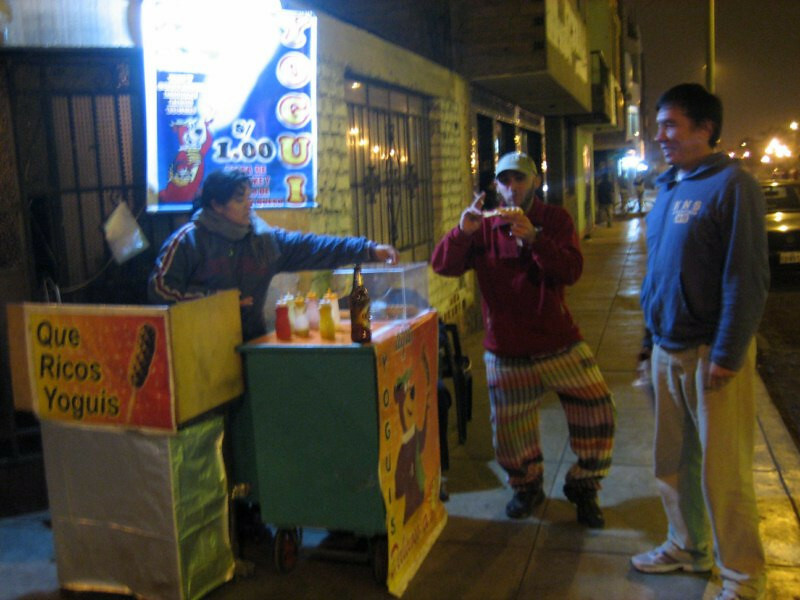 Grabbing a street snack while taking a walk around town. 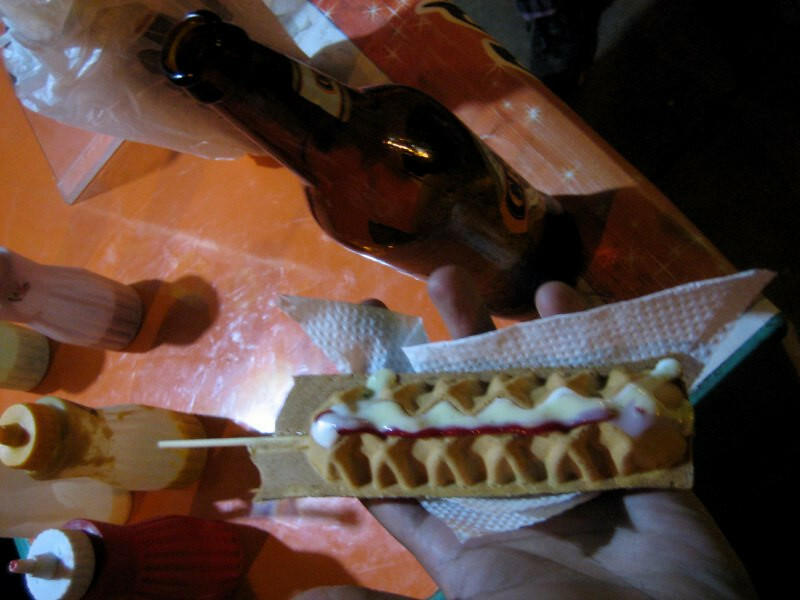 It was a hot dog on a stick in a kind of waffle dough with ketchup and mayonaisse. Tasted quite good actually. 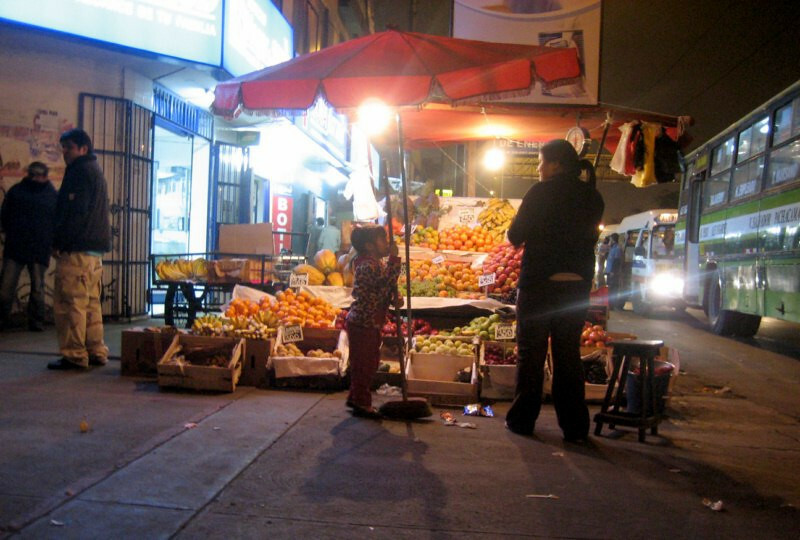 A fruit stand by the bus stop. 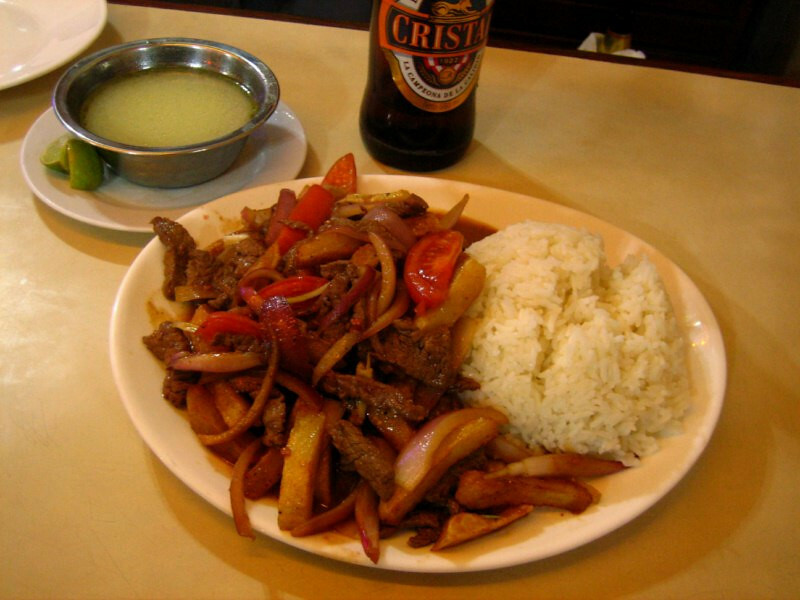 Grabbing some dinner of Lomo Saltado (beef stir-fried with veggies and french fries). Doing an oil change the next day. I bought my own oil and just asked the shop if I could borrow an oil drain pan and they were happy to help. I caught bits of the dramatic Ghana vs Uruguay World Cup match in the store along with random customers and the employees. Whilst everyone else was rooting for their South American brother, I was all for Mama Africa. Talking with the parking attendants on top of the Tottus supermarket (good utilization of space to have the parking on the roof). I finally bought supplies to cook on the road, such as lentils, quinoa, olive oil and oatmeal. I also stocked up on local varieties of granola bars. In Edison’s house before heading out with some friends. Having some cervezas (beers) on the terrace and taking in the sights of the neighborhood. That’s a football game, which might look like a pickup game of basketball in the States. 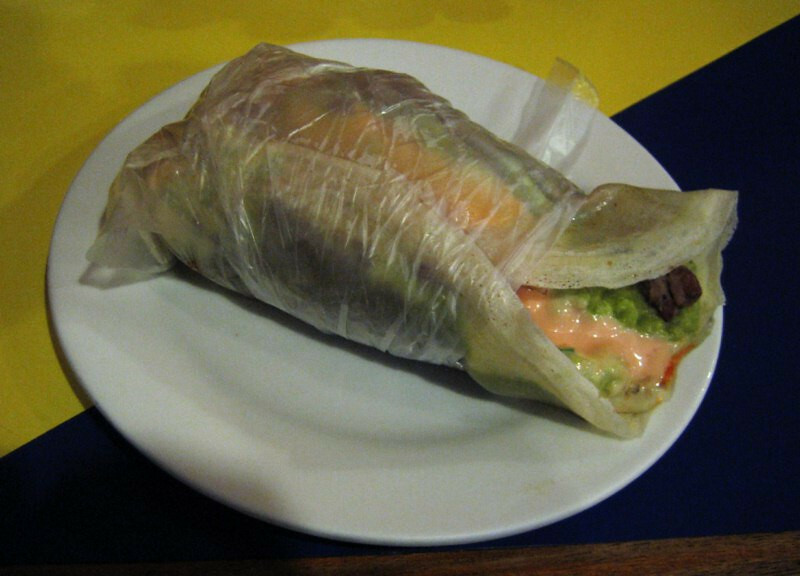 Carlos’ friend said we were going to a Mexican restaurant and I was looking forward to some nice tacos, but can you believe it, this is what they call a burrito? It tasted good, but nothing resembling Mexican food. Catching a show of percussionists. 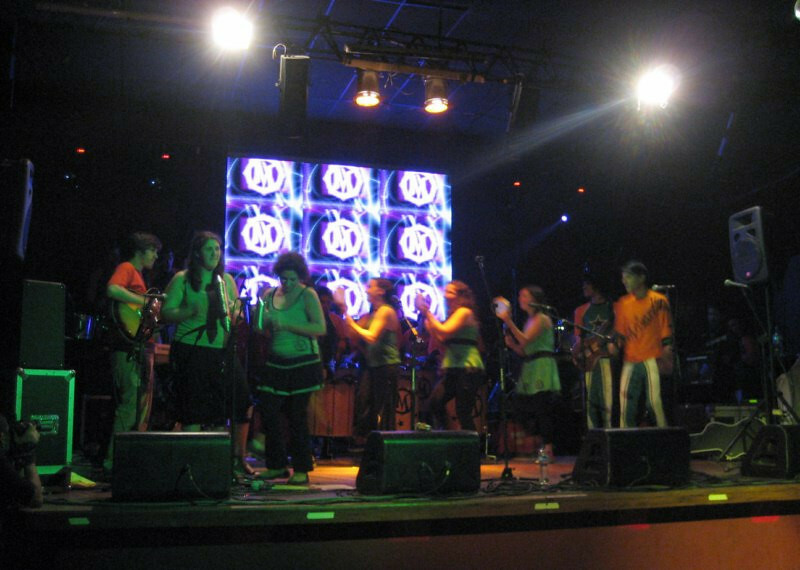 Drums of all shapes and sizes played by a huge number of people. Good time. Fueling up at the cheapest gas station on my way out of Lima. 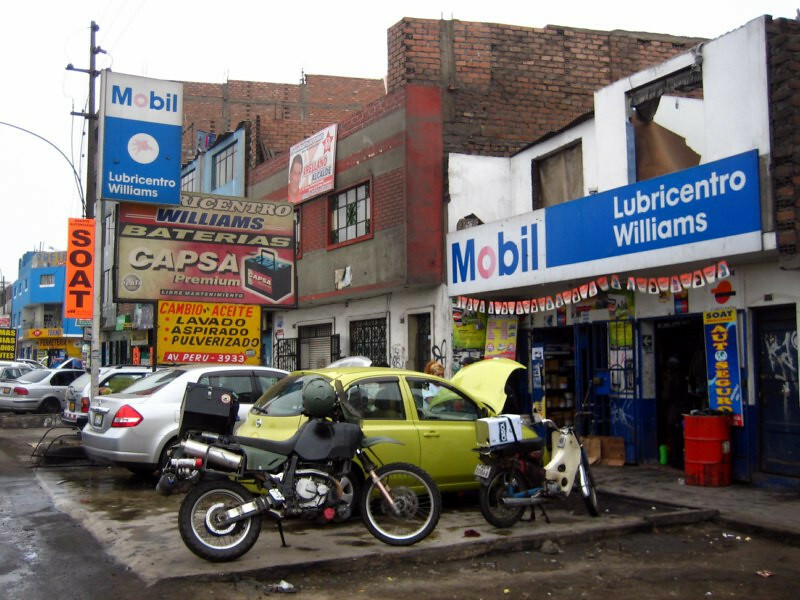 Petrol is quite expensive in Peru, averaging S/.12/gallon = $4/gal and here it was S/.10.83/gal. 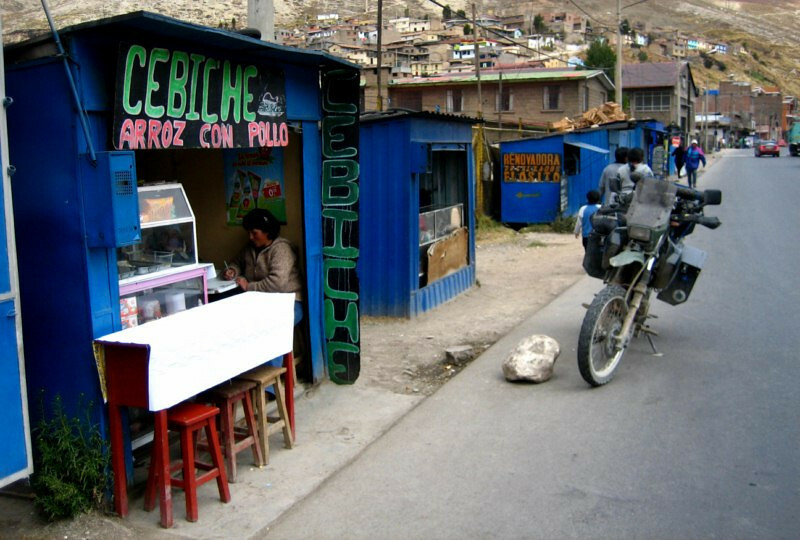 In most of Peru, you can only find 84 or 90 octane gas, so I’ve been using the 90 octane; not much price difference. 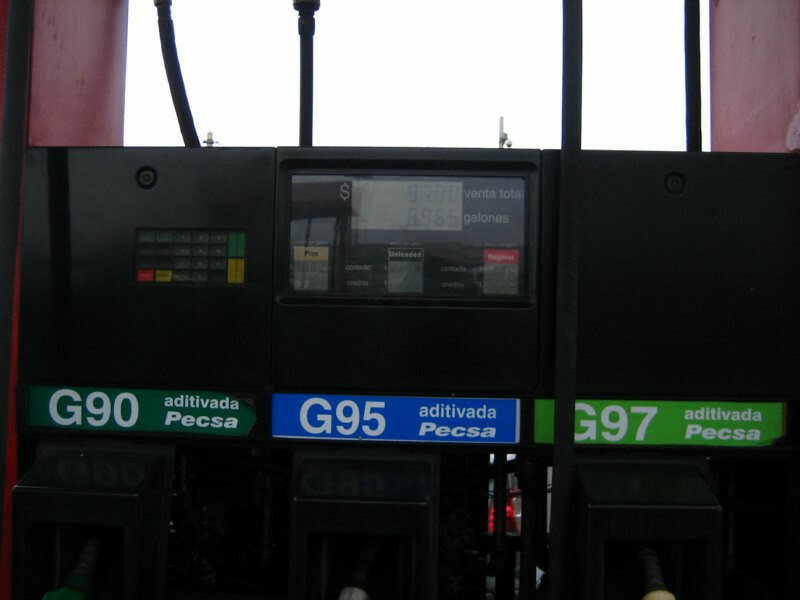 And then only in Lima, where all the fancy new cars are at, they have 95 and even 97 octane. I was told the octane numbers are less than what they state. Convertible trucks? 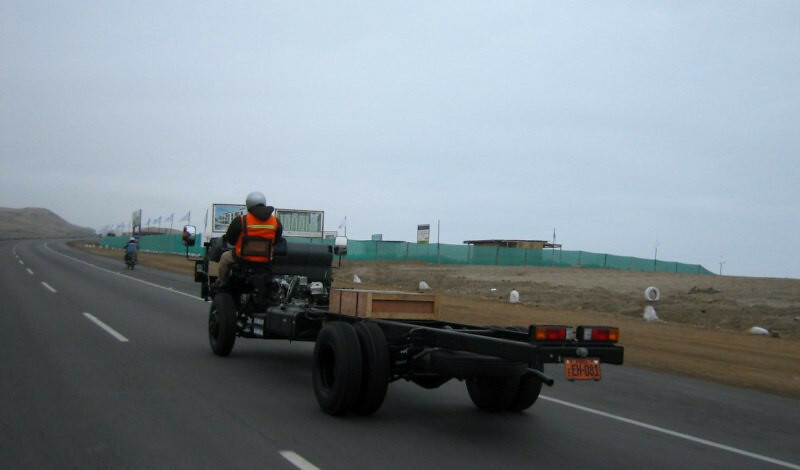 Poor chaps braving the cold winds like us bikers to transport these chassis to their body builders. 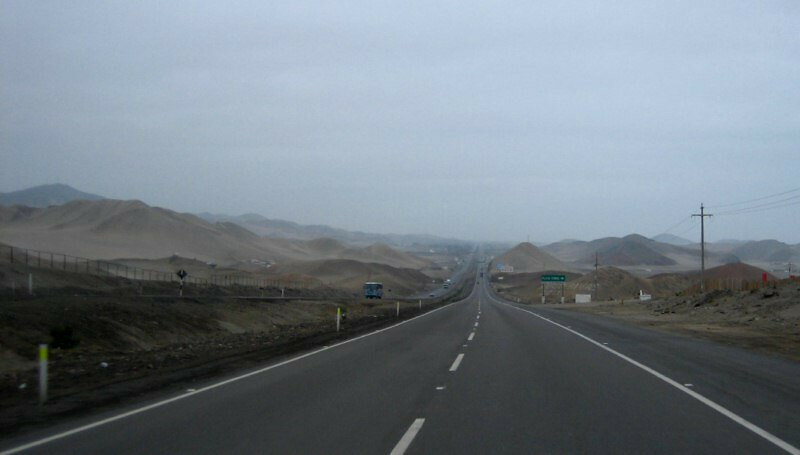 The gloomy overcast clouds stayed with me for about 280 kms (174 mi) south of Lima. The winds were strong from the Pacific, crashing big waves against the rocks. 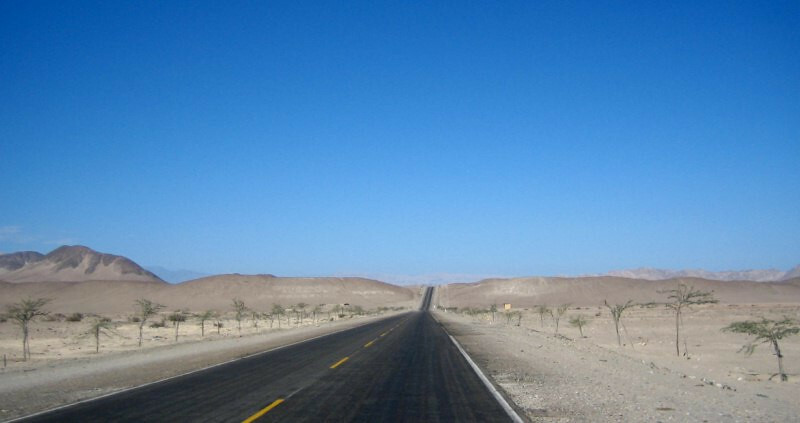 Riding the 4-lane freeway of the Panamericana to Paracas. Time for an audio book. 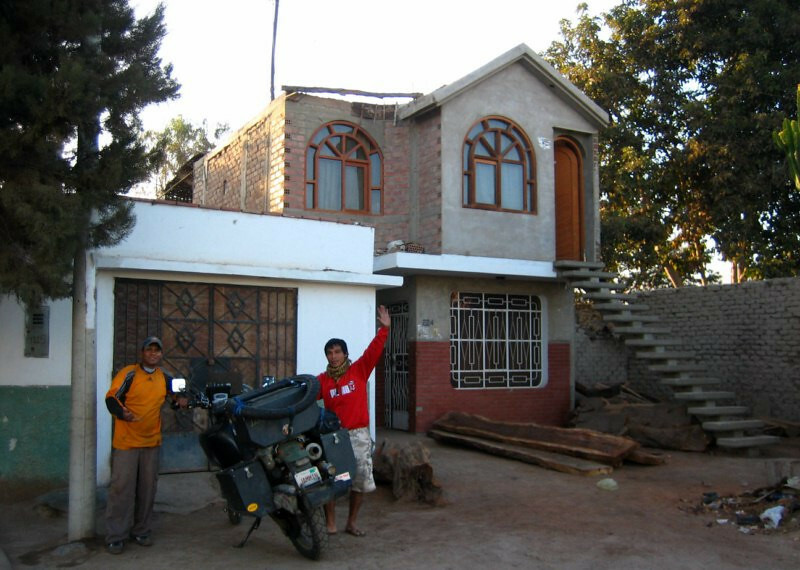 Staying with Jose Miguel in Paracas through CouchSurfing, at the edge of the desert-filled Reserva Nacional de Paracas. He’s runs a tour group with his brother and they go for dune rides in the buggy. Oh and nice to see clear blue skies again. 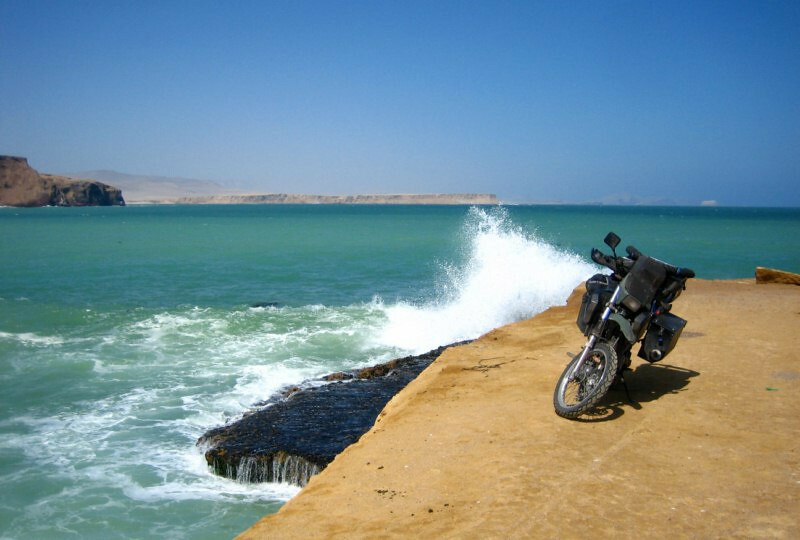 The small town of Paracas with the ocean up ahead. Having breakfast with Jose Miguel (standing) and some of his friends. The couple on the right are CouchSurfers from Uruguay and Sweden who invited me to stay if I swing by Montevideo. 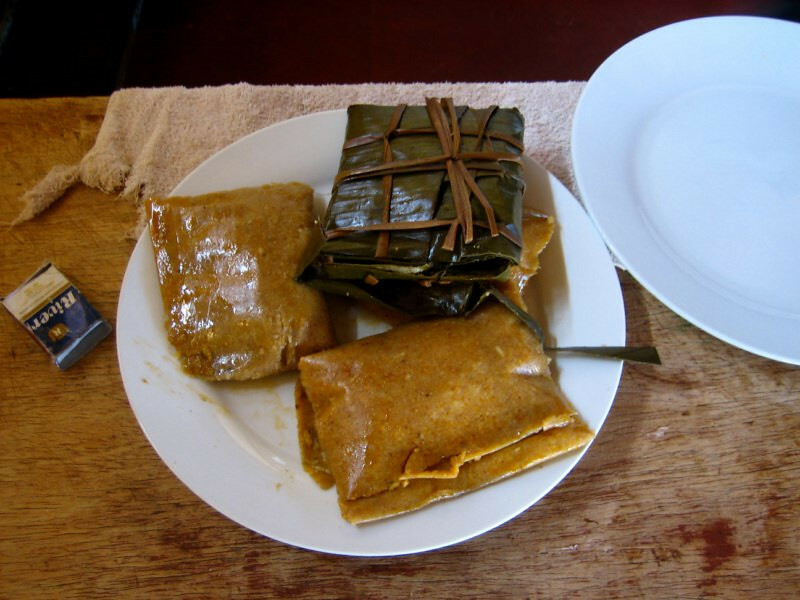 A hearty breakfast of tamales (baked corn meal) with pork and beef. 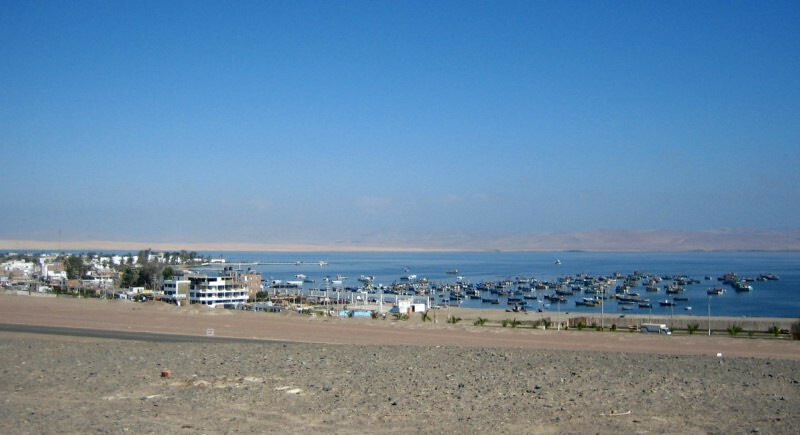 A view of Paracas and its harbor. 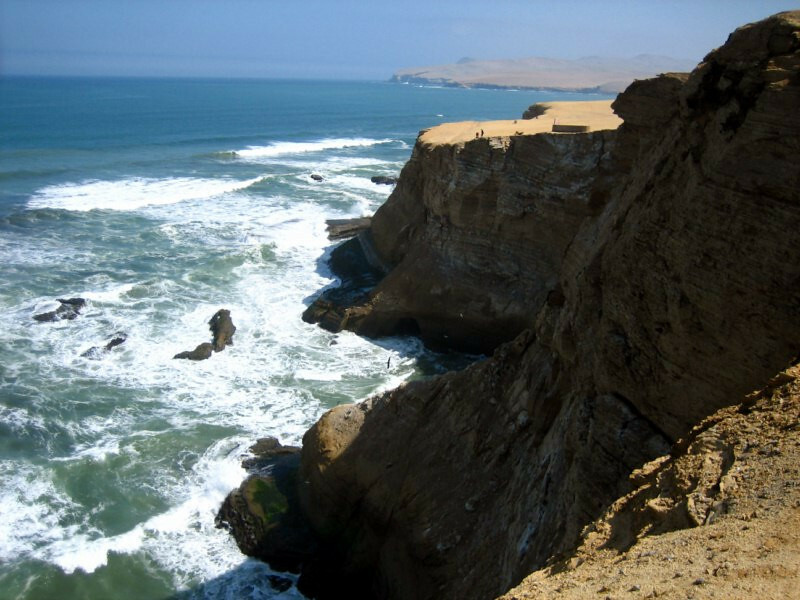 Visiting the nearby Islas Ballestas is major business for the town and is supposed to be a smaller version of the Galapagos Islands. 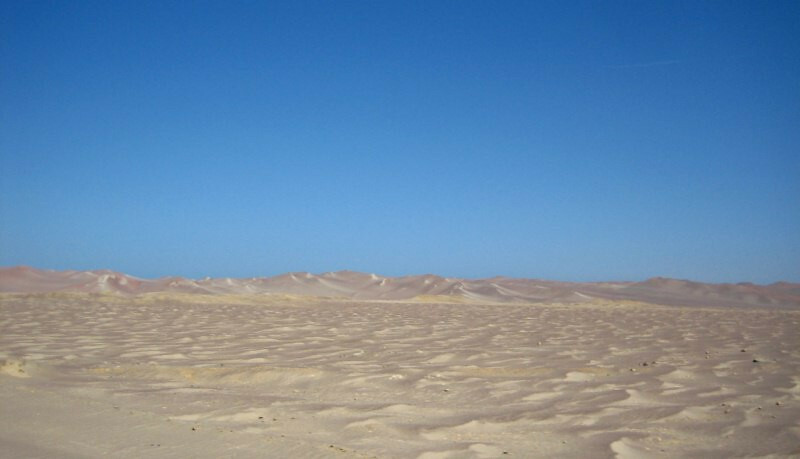 The desert at Reserva Nacional de Paracas. S/.5 entrance fee for a 30 km loop of the park. 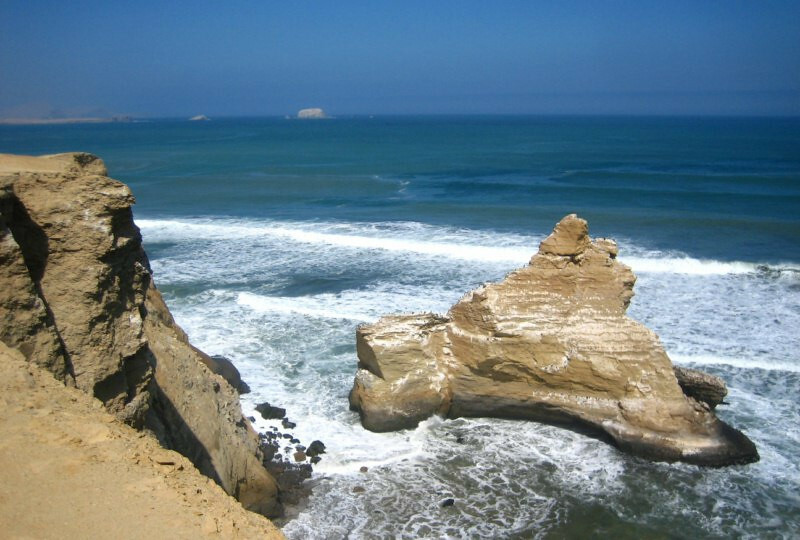 Rocky cliffs butting the desert against the ocean. 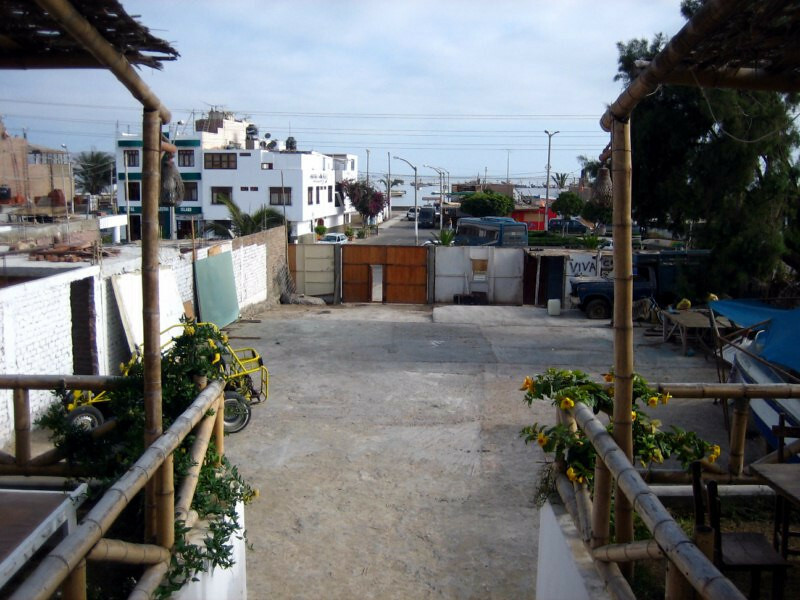 …it came crashing down during the strong 8.0 earthquake in 2007, which also destroyed most of the town of Pisco. Taking in a different view of the cliffs on the shore. There was a general path in the sand, but the track split with no directions. sanDRina with a huge bay. The wave crashing and releasing its energy against the land, propelling me forward. Back on the road south. 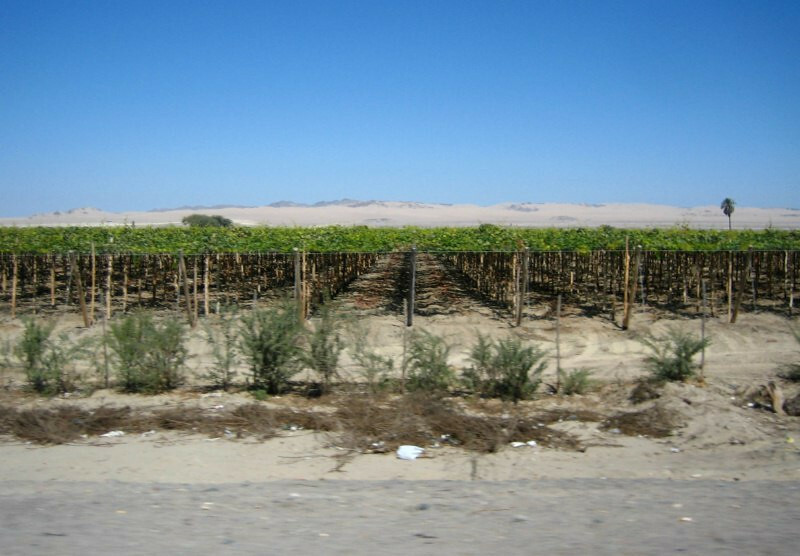 Vineyards, most likely for Pisco, the national drink – a brandy made from grapes. 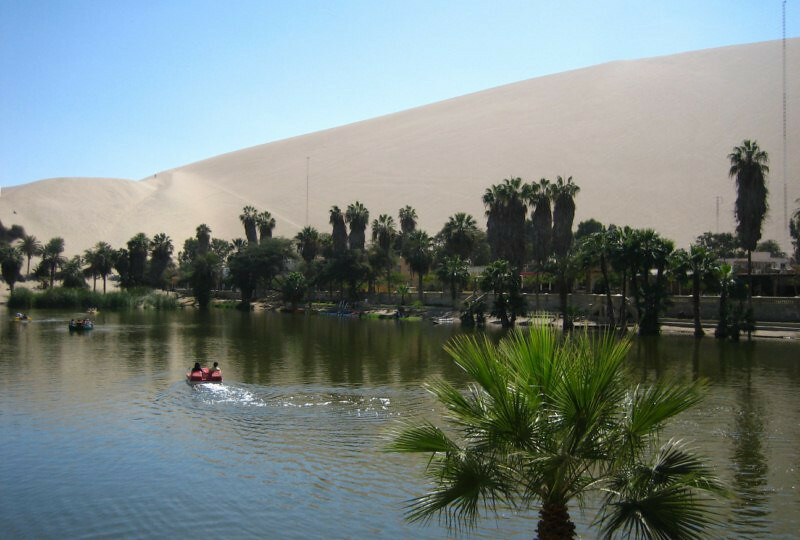 Taking a quick look at the desert oasis of Huacachina, surrounded by tall sand dunes, where sandboarding is popular. It’s overrun with tourists and tour groups trying to milk as much as possible from this natural oasis in the desert. 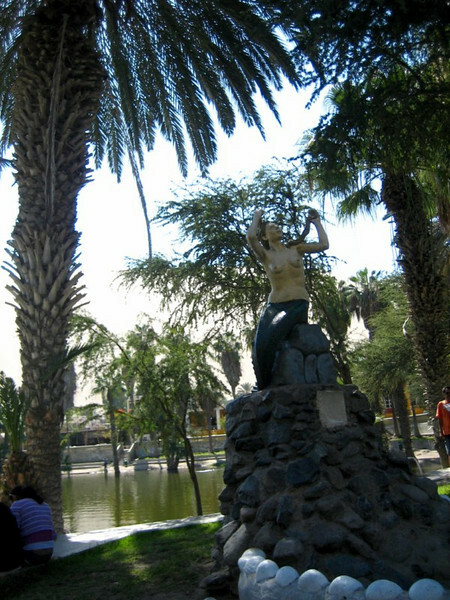 Local legend of a mermaid that seduced people who visited the oasis. They were probably so thirsty, it didn’t take much to conjure up a mermaid to welcome them. 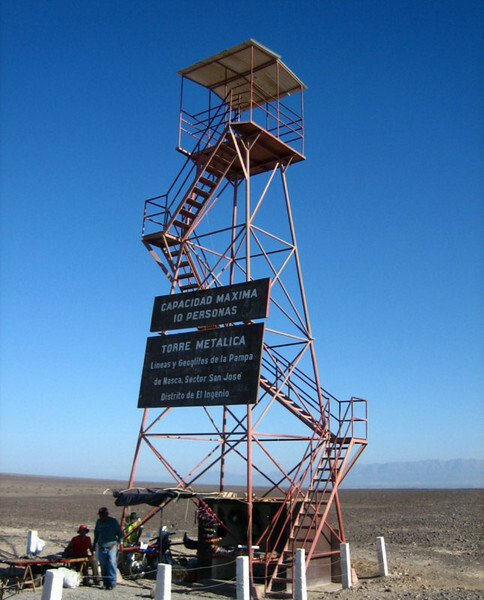 You can either pay around $60 for a flight over the lines or S/.2 to climb up this tower and take in two diagrams. Seeing this image on the left, it’s either a frog or a fish. 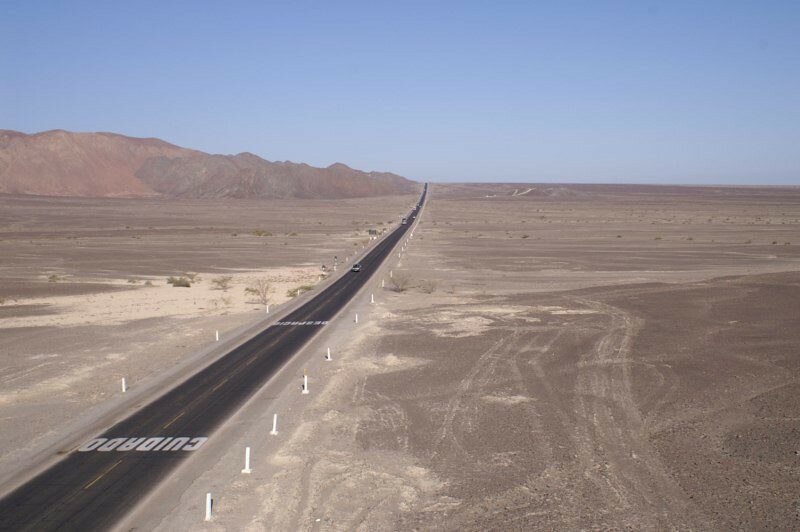 The current thinking is that the lines were made by removing sun-darkened stones from the desert surface to reveal the lighter soil below. But to what their purpose was and who actually made them is still a mystery. 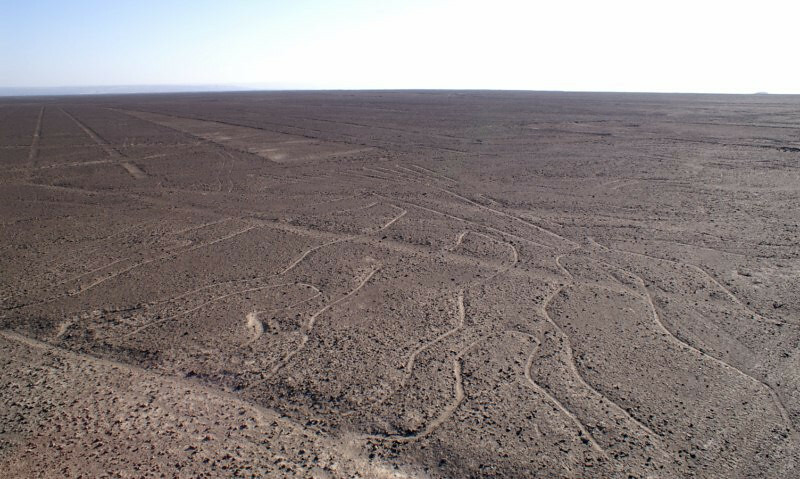 Even from the tower, you can marvel how these lines have lasted for around 2,000 years in the sand and amazing that they haven’t been vandalized yet or disfigured from erosion. 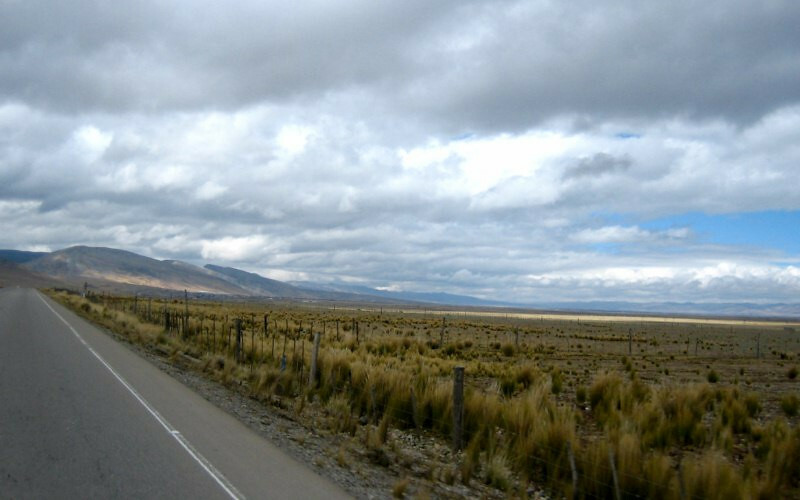 Looking south from the tower at the ribbon of tarmac that is the Panamericana Highway. 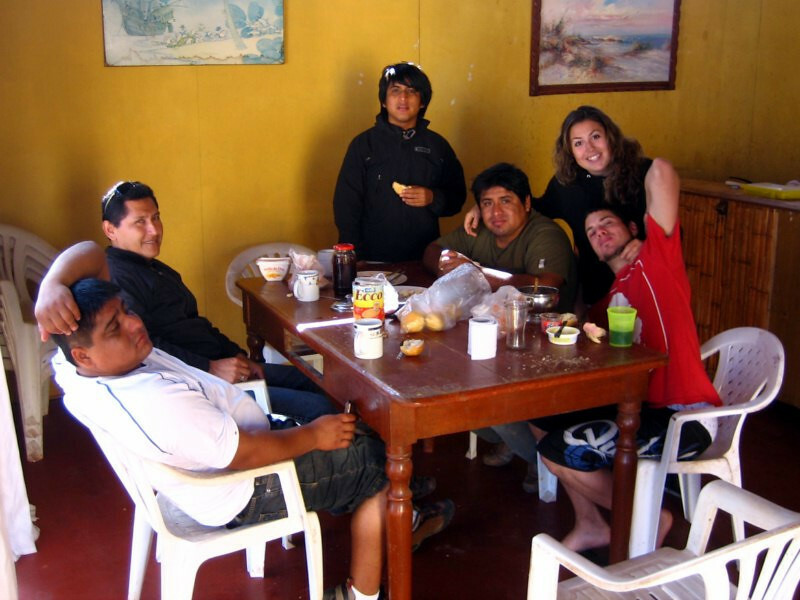 Staying the night with Ruben through CouchSurfing in the town of Nasca. 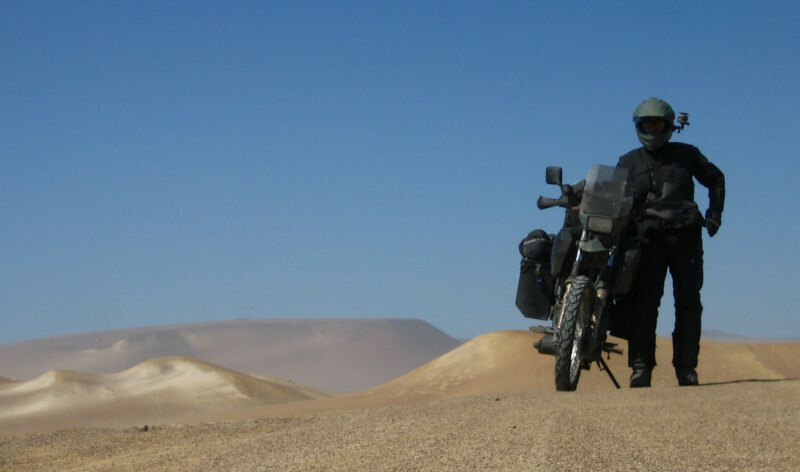 He’s also a rider, having a Yamaha 600 and his brother has a new KLR650. They’re carpenters making custom furniture for restaurants and hotels.